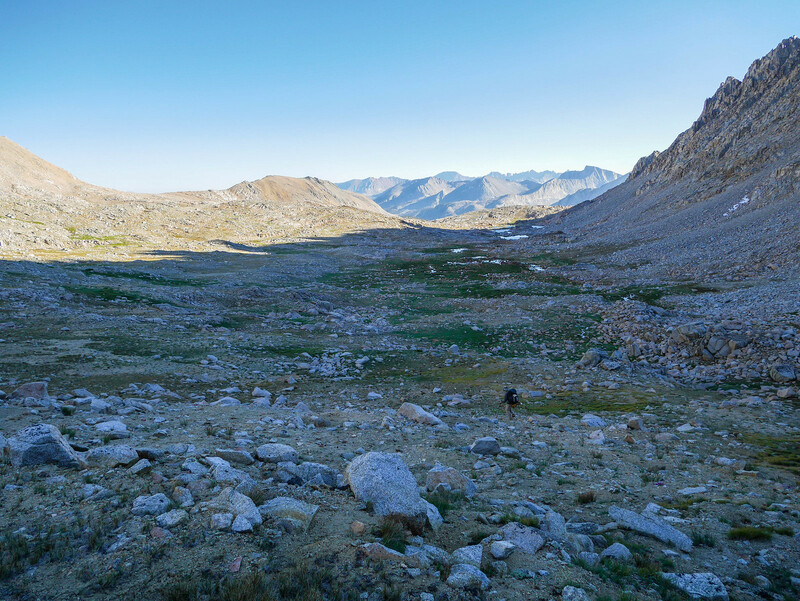 A big ol' loop from the depths of the Kings River up to the Sierra crest and back round again. 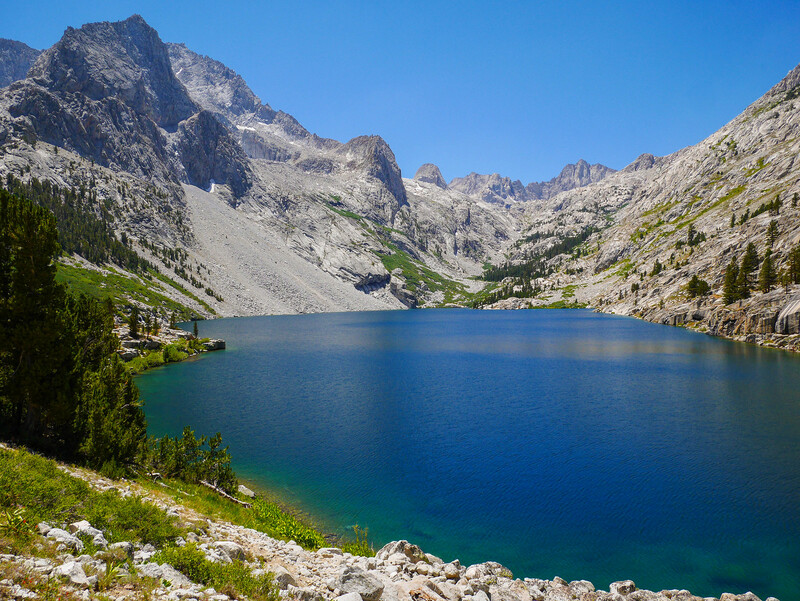 Jason and I completed a modified version of the classic hike dubbed the "Circle of Solitude" by Mike White in his book Kings Canyon National Park, cutting south to Lake Reflection and heading off-trail over the awful death trap that is Harrison Pass instead of taking the longer route over Forester Pass. I'd been eyeing this loop since reading CaliTrails report of it in 2013. 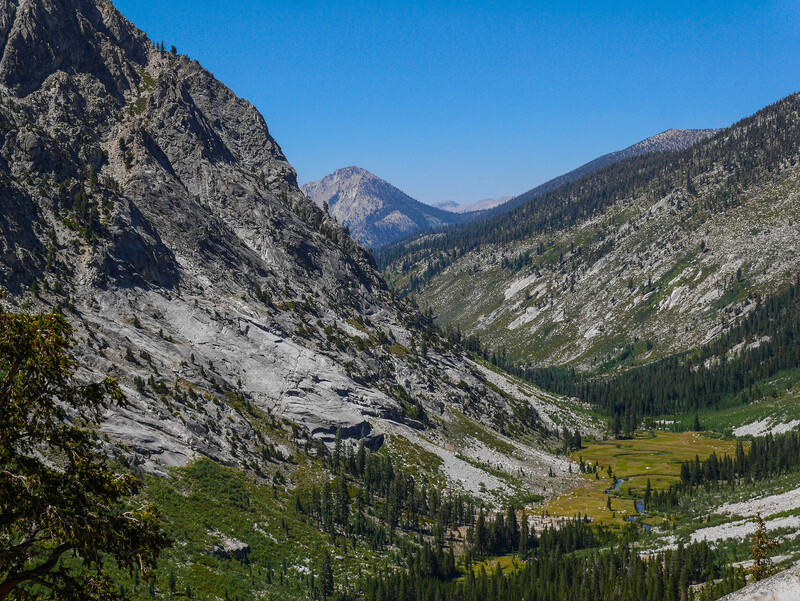 Coming from LA, an east side entrance over Kearsarge Pass made sense for him, but the one of the things that made this loop appeal to me is the combination of a west side entrance with all the glory of lots of time spent in the high country. The trip was as gorgeous as I'd imagined and Harrison Pass pushed both Jason and me to (past?) our limits of comfort. 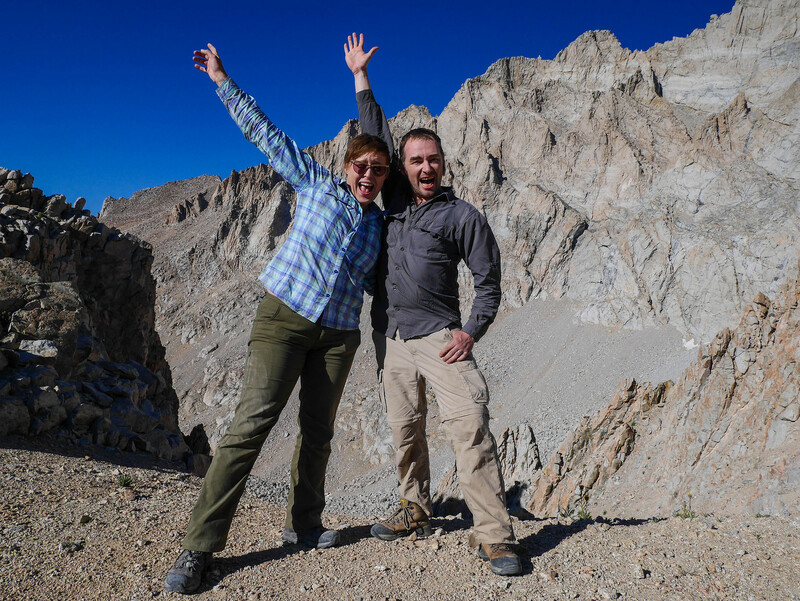 I had reserved a permit for myself months in advance, but all the reservable permits were gone by the time Jason decided to join me on this trip. He drove down the night before (Day -1) so that he could be first in line at the permit office when it opened. He grabbed his permit and then spent the day hanging out around the Roads End area.Jason and I had planned to meet up at 7pm at the ranger station, but I hit traffic and knew I wouldn't make it on time. We knew there wouldn't be any cell service down in the canyon, so our backup plan was to check in every half hour at the permit station. When I knew I'd be late, I called the ranger station before they closed and had the super sweet ranger leave a note on the message board that hopefully Jason would find. Unfortunately, I had forgotten that the permit station at Roads End is separate from the Visitor Center, which I had called. The permit station is all the way at the end of the road where the trails up Bubbs and Woods creeks start, but the Visitor Center is about 6 miles before that at Cedar Grove. So, while Jason was waiting patiently at the permit station, my note was flapping in the breeze miles away. Whoops. I arrived down in the canyon around 8:20pm and found my note on the board at the Cedar Grove visitor center. I waited there until 8:30pm, then drove through the campgrounds looking for but not finding Jason. I went back to the Visitor Center at 9pm and still he wasn't there. I checked the map again and noticed the permit station at the end of the road, so I drove out there. It was empty. I parked and poked around and there was a note from Jason on the board there! Phew. I found him at the campsite he described around 10pm and set up my tent and crashed. Coordinators take note: opportunities abound for confusion in meeting up in the valley! 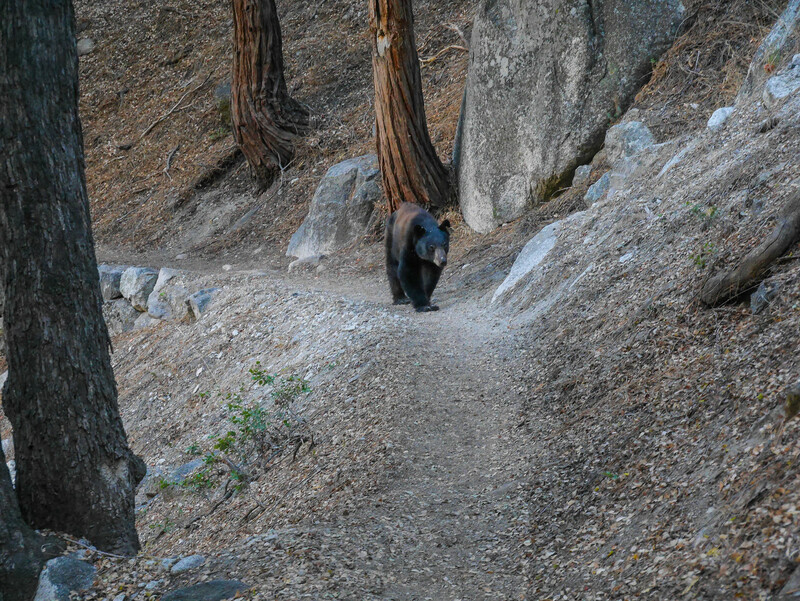 We packed up camp and drove over to Roads End where we were greeted by a chill bear who was interested in the breakfast some dudes were cookin' up at a picnic table near the Copper Creek Trailhead. 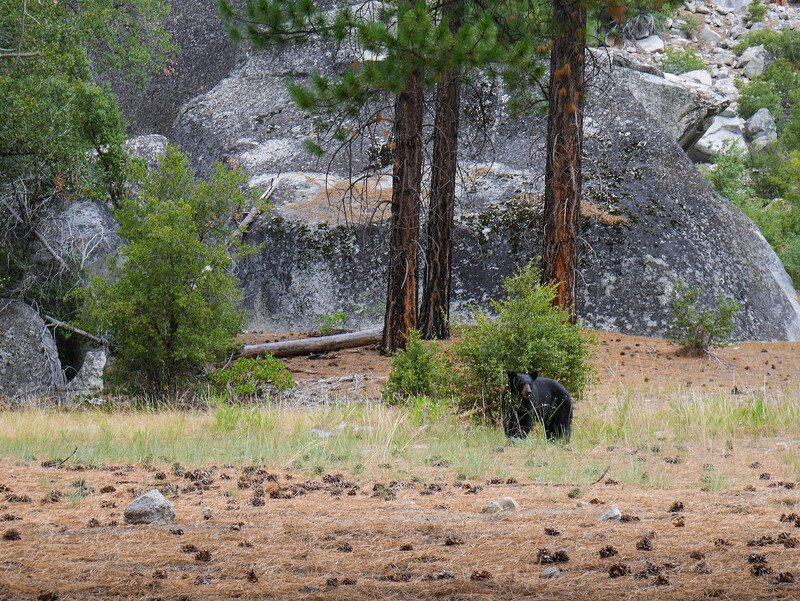 You are pretty much guaranteed to see bears roaming around Roads End. On the trail in earnest, the first bit is flat as you hike from the end of the road back into the valley. 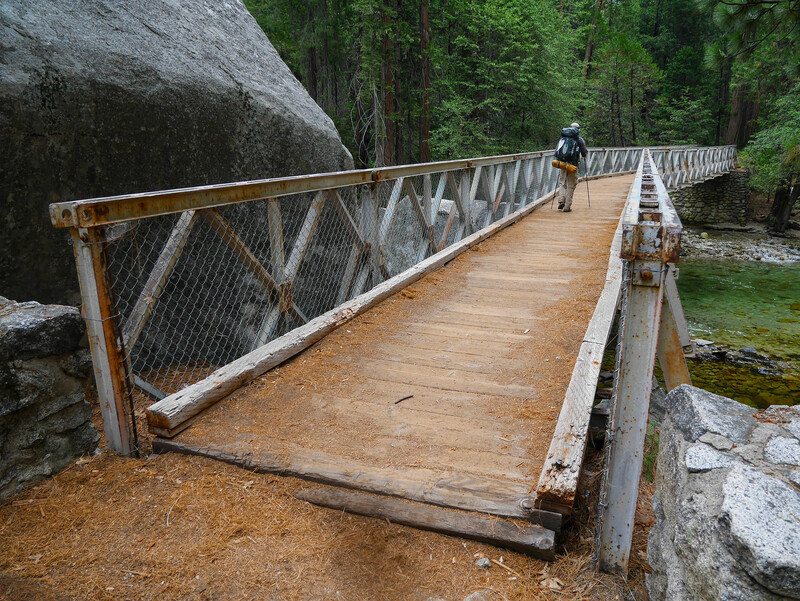 The bridges crossing Bubb's Creek mark the end of the flat and the start of the elevation gain. The trail is well-graded on switchbacks, so it's not too strenuous, and as we climbed we were rewarded with views back down the canyon towards Roads End. 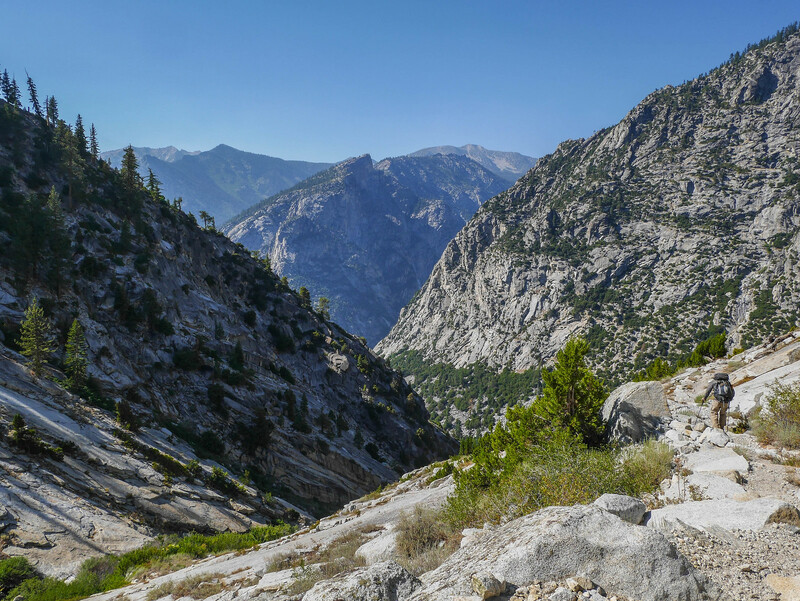 After gaining about a thousand feet or so on switchbacks, the trail flattens out and ascends at a moderate pace on par with Bubb's Creek's flow down the valley. 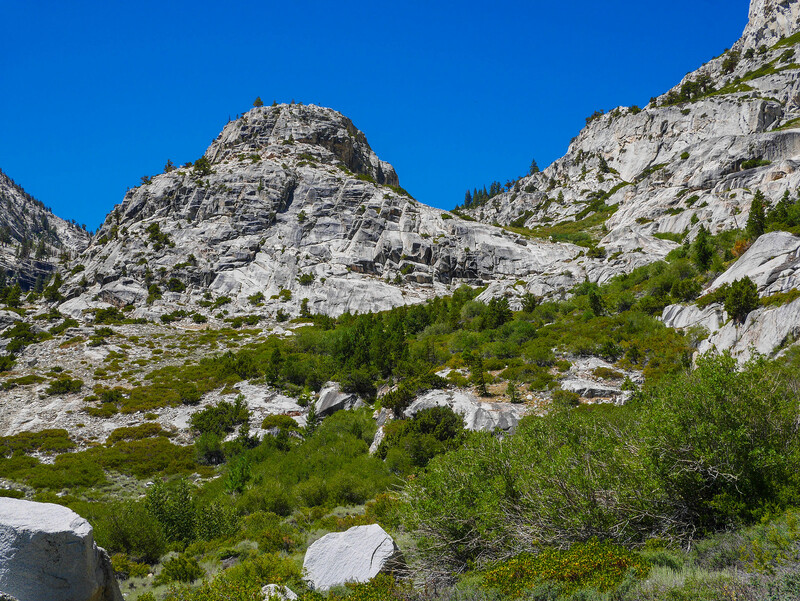 The trail passes in and out of forested areas, sometimes opening up to views of the big walls of granite that enclose the canyon. I was feeling strong (as I often do at the beginning of a trip), but Jason was getting tired and the altitude was getting to him. (This would swap to be the other way around at the end of our trip, when Jason would fly up to Avalanche Pass as I struggled to put one foot in front of the other.) 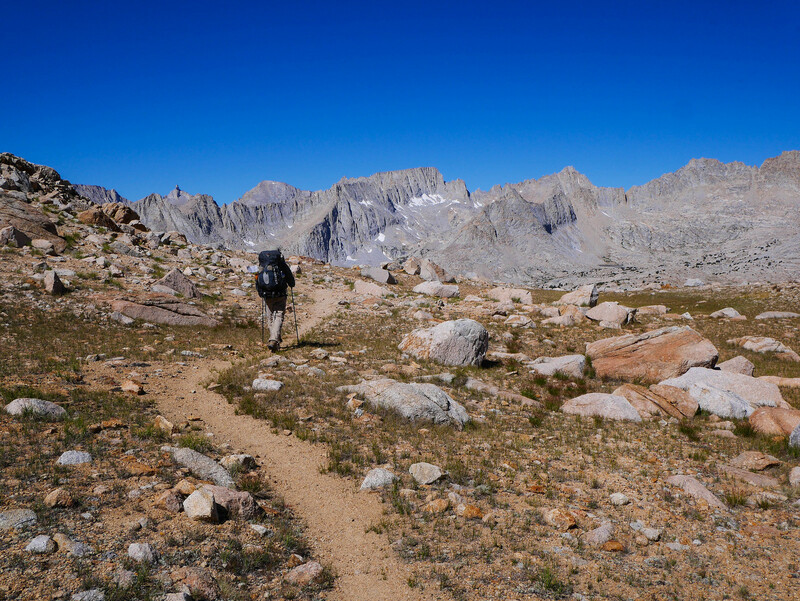 When planning, we thought we might stop somewhere along Bubb's Creek to camp for the night, but we decided to push on to crossing where our route turned south on a spur trail to East Lake, diverting from the main Rae Lakes loop route, which would continue east, following Bubb's Creek.The Bubb's Creek crossing on the trail to East Lake can be swift and dangerous in the early season. Bubb's is a major artery for the snowmelt. Even now, early August of a dry year (2016 snowpack was 73% of average), the ford came up to my knees. Jason made it across on a pair of slippery, skinny logs. There aren't a lot of places to camp between the crossing and East Lake, which was beyond our reach for the day, so we snagged a campsite near the bear lockers in the woods just south of the creek.Putzing around camp, we ran into a family with two boys not more than 10 years old who had come down from off-trail Longley Pass, which they reported had a big snow cornice on it. Jason and I were both definitely a bit taken aback by seeing such young kids out on an adventure of that sort, but the kids seemed totally unfazed. 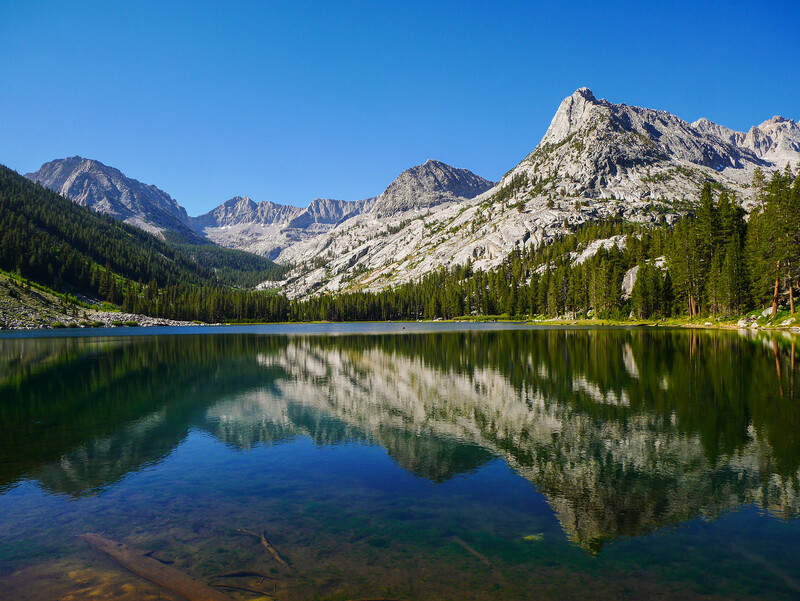 We took our time getting up in the morning, knowing we'd only need to make it to Lake Reflection, less than four miles away. We filled up our water back at Bubb's before packing up and heading out. As the trail climbed the south, we were rewarded with wildflowers and expansive views of the Bubb's Creek canyon below. We stopped for lunch at East Lake. My photos from this break are garbage because I didn't notice that my camera was on some stupid ultra-saturated setting. Whoops. The maintained trail ends at East Lake, but there is a use trail that continues to Lake Reflection. It was easy to follow in the beginning, but it begins to peter out after a while. 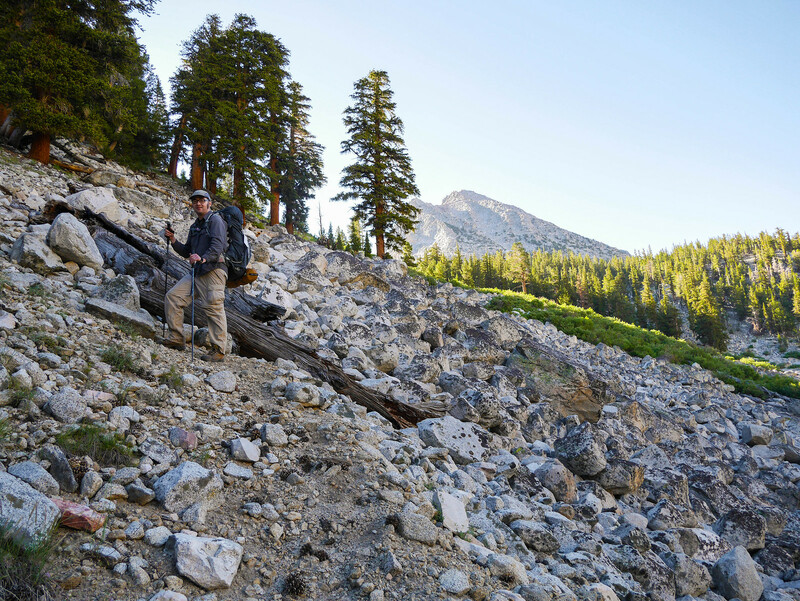 We found it easier to climb above a small talus field we encountered, then we headed back down towards East Creek, following cairns here and there before picking up a more defined trail close to the base of Lake Reflection. With several hours still of daylight to kill, we took a dip in the smaller section of Lake Reflection, close to its outlet. Jason asked me if I wanted to take off my altimeter/gps watch and I was like nah it's a diving watch, good to 100 meters! This turned out to be a mistake and the altimeter's readings about our elevation change would be a source of comedy for the remainder of the trip. When I got home and went to send the watch off for warranty repair, I realized that it was two weeks beyond the expiration of the warranty. I'm pretty sure there's a Garfield comic with a similar theme. Yep. Man I hate Mondays. 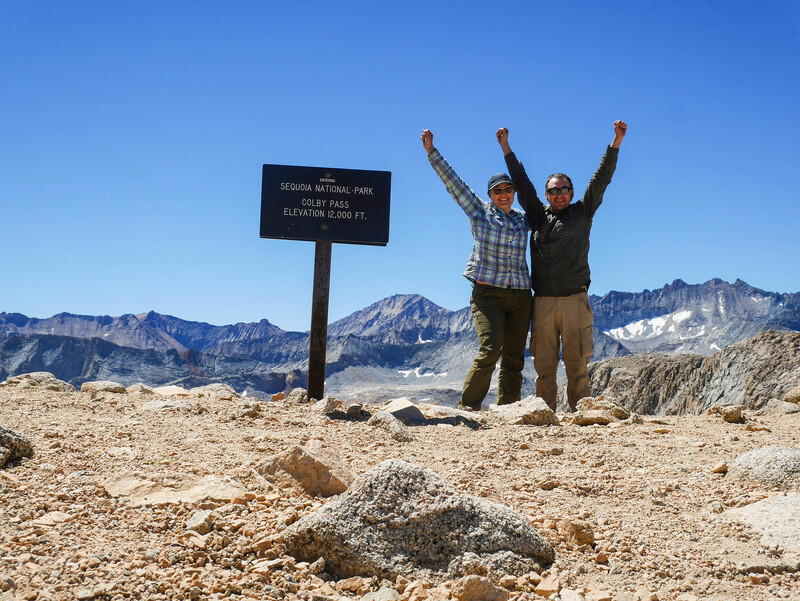 Today was the big day---the day we'd tackle the only off-trail pass of the trip. We rose with the sun to get some photos of the things that Lake Reflection is named for before packing up and heading out around 8am. Look how happy Jason is here. He has no idea what's to come. It's almost like when I listen to podcasts recorded a week or so before the 2016 presidential election---it's endearing to visit that world, a world where they Don't Know Yet. We followed the use trail that Jason had found. 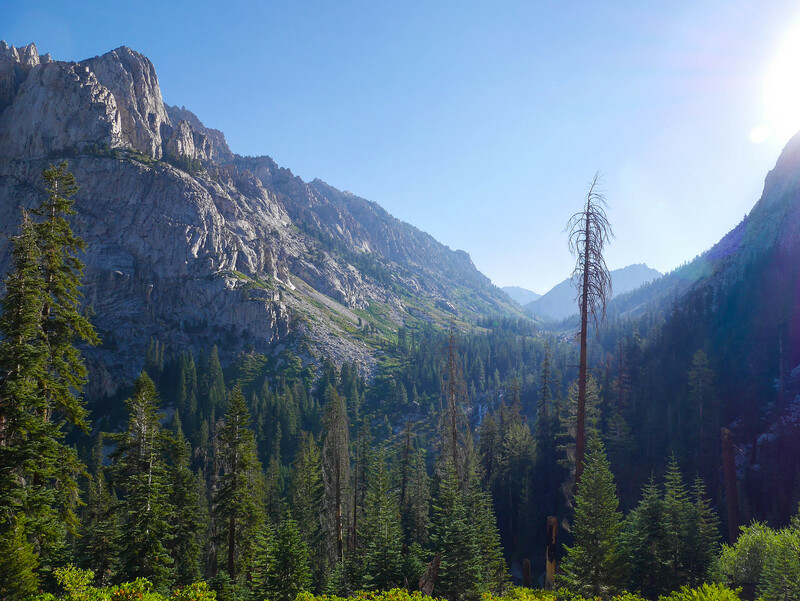 It starts around the northern part of a clearing, towards the northern edge of the canyon that leads east towards Harrison Pass. It's *not* on the south side, where the stream coming down from the tarns below Harrisson ends up. To find it, look for this open brushy area with horizontal streaks of talus, and head to the left of the talus. 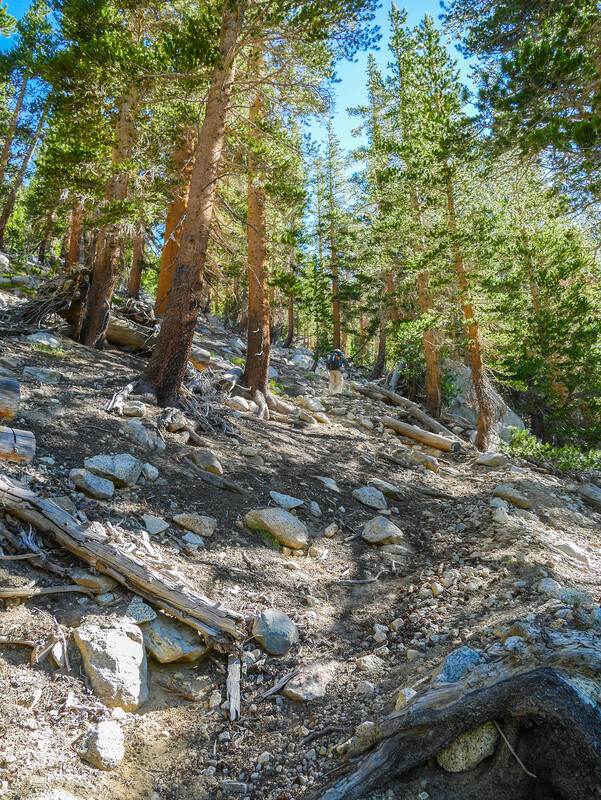 The use trail climbs steeply, but soon enough it flattens out in a wooded area. From here, you can see another small hill a bit ahead. We turned southeast at this point to avoid gaining too much elevation on the north edge of this hill. 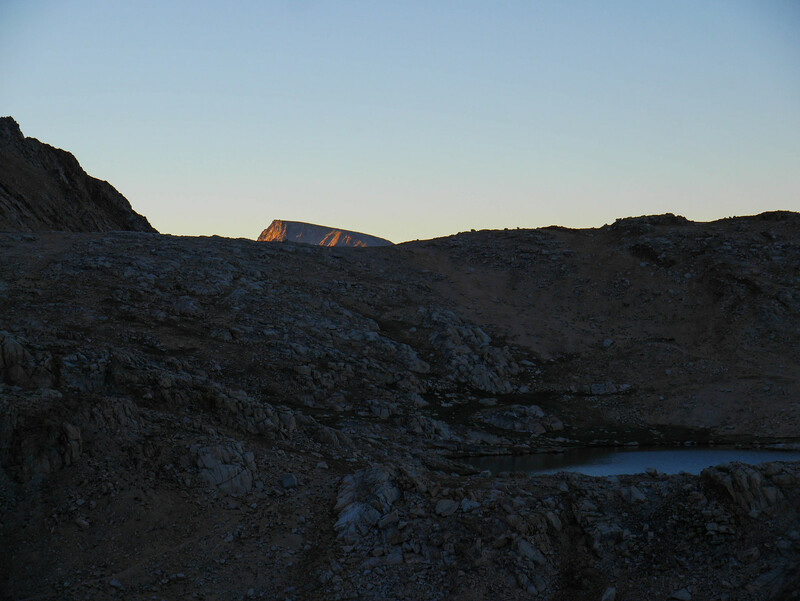 After we gained the ridge, we had an amazing view southwest towards the peaks surrounding Lake Reflection. We could see the cornice on Longley Pass, too. 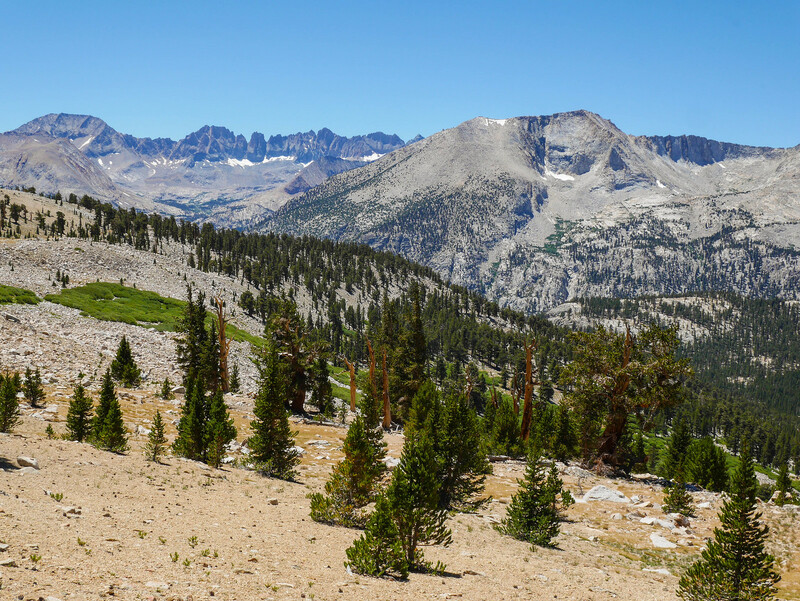 It's that strip of white that can bee seen on the ridge line in the photo below. We came to an area where the terrain flattened out and opened up and since we were feeling confident (lol!) about our progress (lolllllol!!!) so far, we took a quick snack break where we'd have a view of the route ahead. We had to cross the creek that's running down the middle of the green slope in the photo below, and then we'd climb the slabs on the right (south) side of the creek to finally reach the talus and tarns below Harrison Pass. Easy enough, right? Wrong. Finding a good spot to cross the creek turned out to be trickier than expected, since the side we were on had about a 20 foot cliff along most of it. We managed, though, and soon enough we were climbing the slabs as planned. We took our lunch break at the large tarn whose outlet spills over the edge and down the way we'd come. 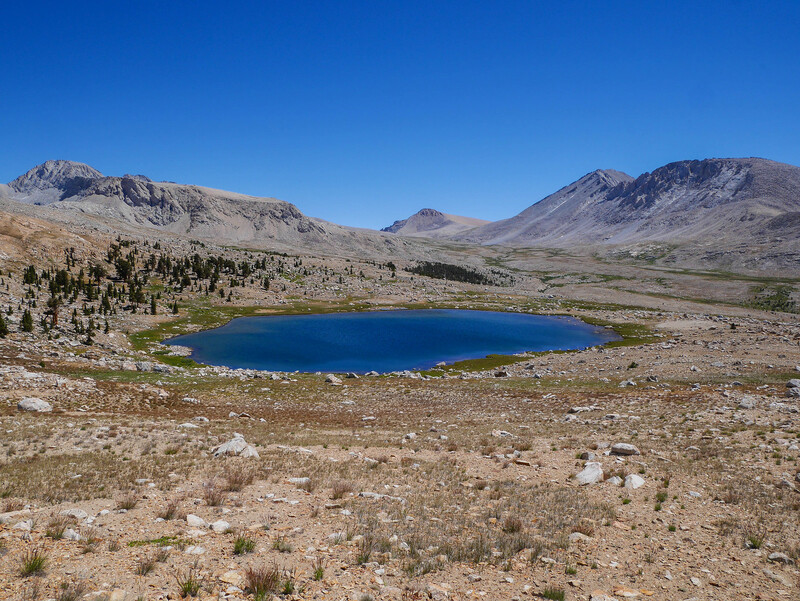 We were able to mostly follow use trails around the few tarns in this area, first heading southeast around the main tarn, then cutting north between it and the next, then heading straight east along the north edge of the final tarn. And then there was talus. So. Much. Talus. And unstable, too. Usually, I find talus annoying and tedious, but not dangerous. Not this talus, though. As if foreboding what was to come, it was loose and unstable. Boulders the size of VWs would tip forward as we stepped on them. It got steeper and steeper. At one point, I lost my balance and tumbled forward, banging my knee and setting my adrenal glands into overdrive. 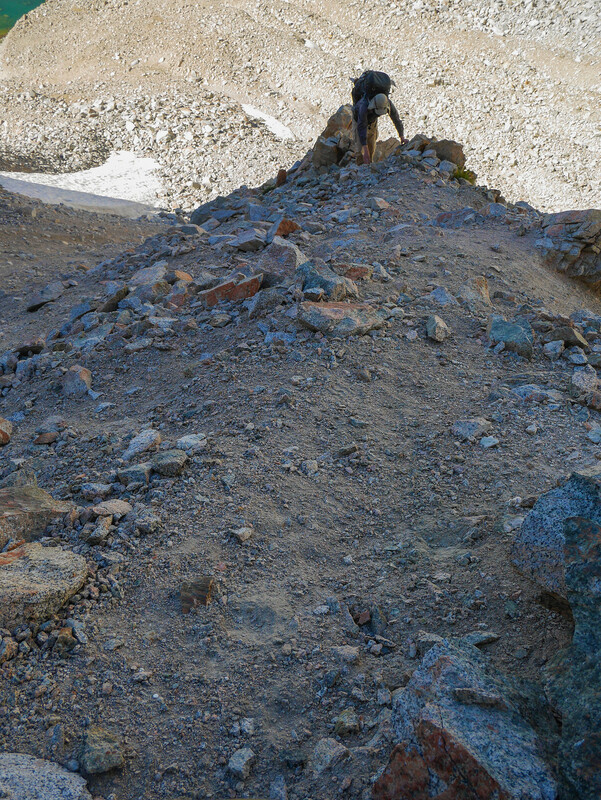 But then it flattened out, and the talus gave way to what for a moment looked better, but turned out to be worse: steep loose sand and gravel. This photo just does not do justice to Harrison Pass, which is the sandy large gap in the cliffs. It looks like it's going to be no problem, right? 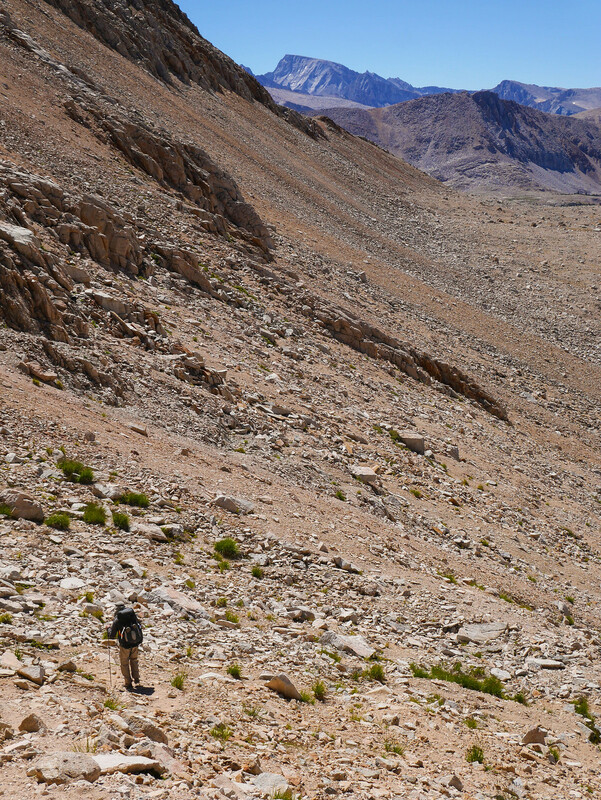 Just hug those rocks on the left, it's not to steep, easy peasy, we'll be there in half an hour! 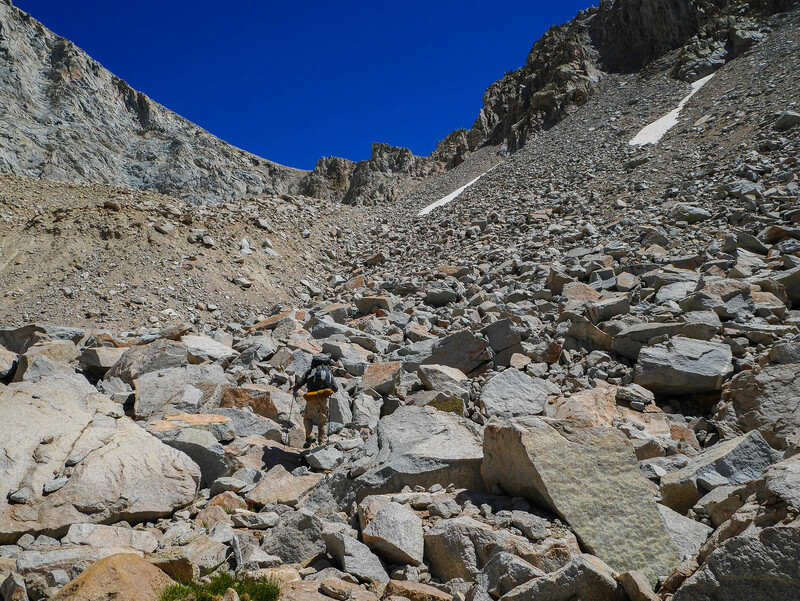 In reality it took us two hours for just this last few hundred feet.Because everything was so loose, we had to climb with only one person moving at a time so that we were sure we wouldn't knock basketball-sized boulders down on each other. Every step was slippery and unstable, every other rock we tried to grab for hold on the cliffs was loose. 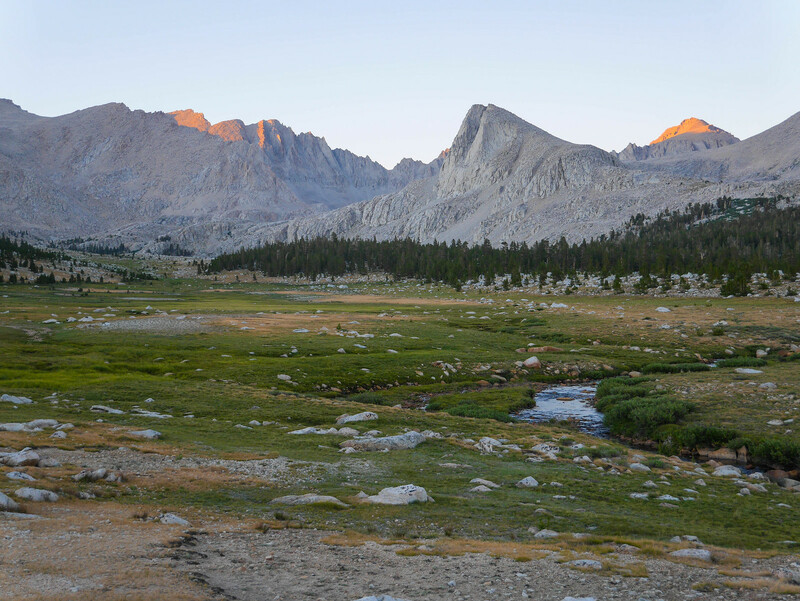 I couldn't believe this pass used to be used to drive sheep to graze in the Kern headwaters on the south side. We did get to see some skypilot, though! 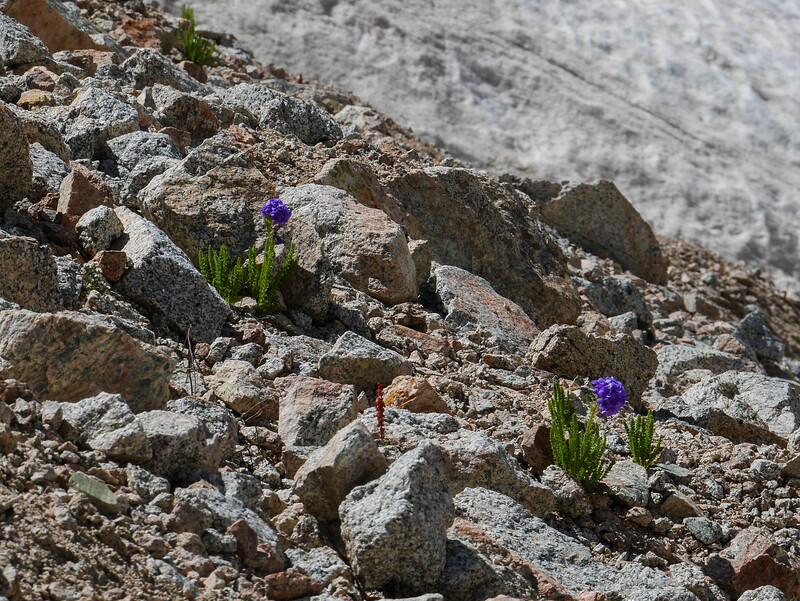 This gorgeous flower only grows in the talus slopes of the Sierra above about 10,000 feet. 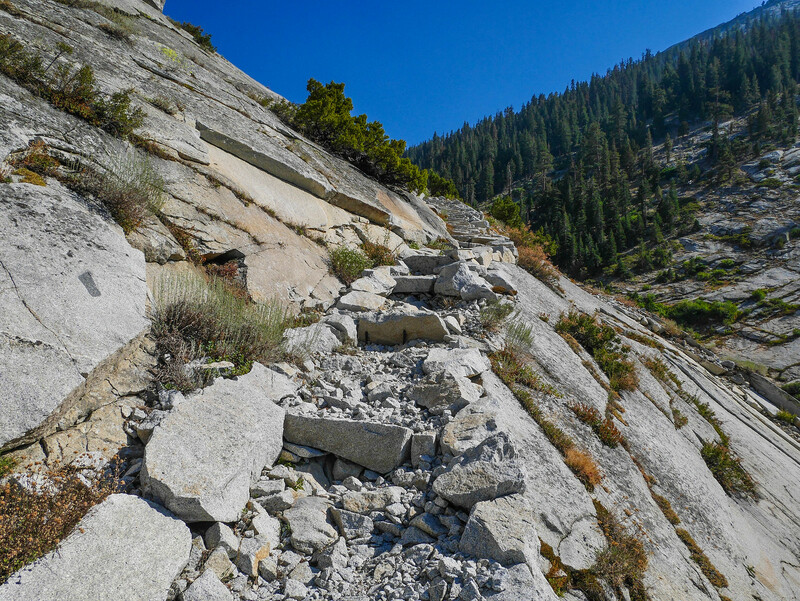 Maybe these next photos give a better perspective on how loose and steep Harrison Pass was. 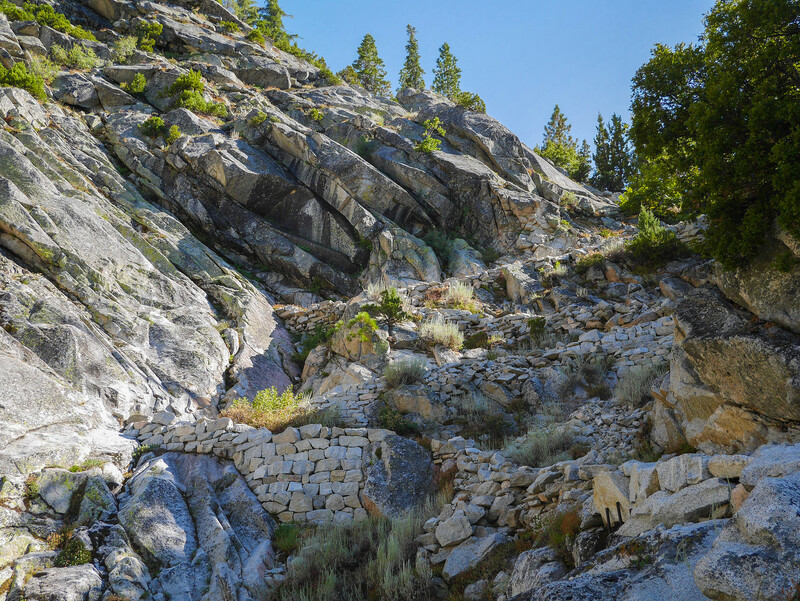 Just piles of boulders of varying size embedded in a steep sandy slope. Towards the end we had the choice of sprint-scrambling up a super steep section of sand at the very top of the pass, where a slip would have sent us sliding all the way back down, OR climbing over a ledge. Yay, choices! I love having options. 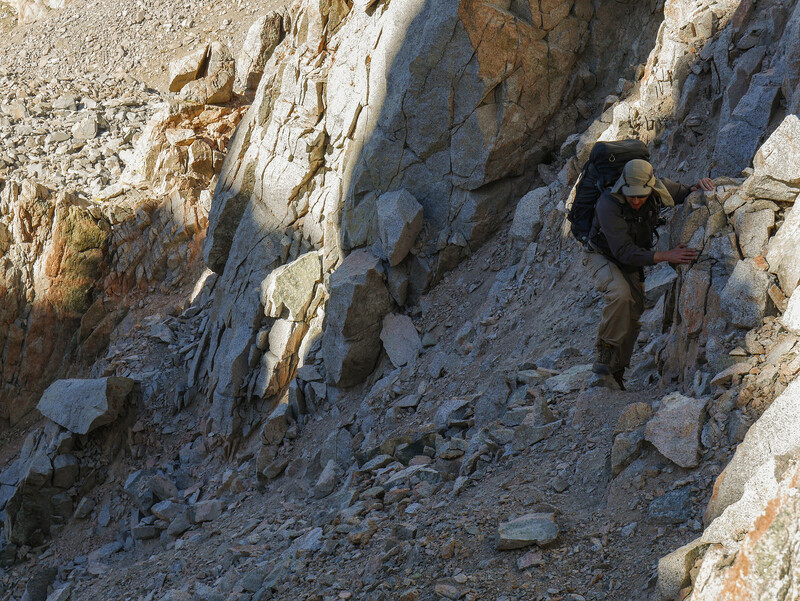 We were both exhausted at this point, and Jason went first, choosing to make a go of the steep sandy slope. I stood and watched. I wasn't confident that I could maintain the effort needed to make it to the top, so Jason dropped his back and came back to the top of the ledge where I was. I hoisted my pack up to him and then climbed up myself. Finally, we had made it!Jason was an amazing person to do this with. Together, we kept each other calm. Even in times where it was dicey, we didn't instigate panic in each other. I felt super lucky to have been doing this with him. Good job team. After the pass, we had a mile, mile and a half, of cross country travel to make it to Lake South America. 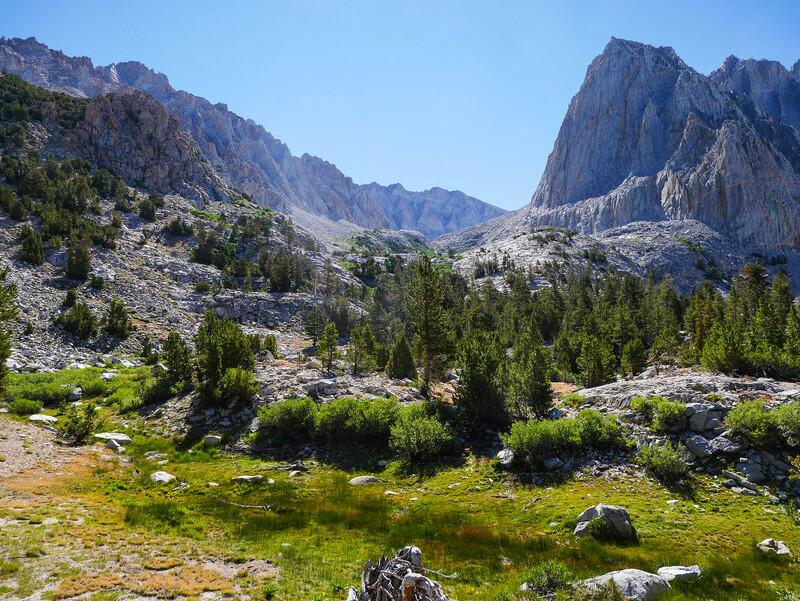 This area, the headwaters of the Kern River, was incredibly beautiful. 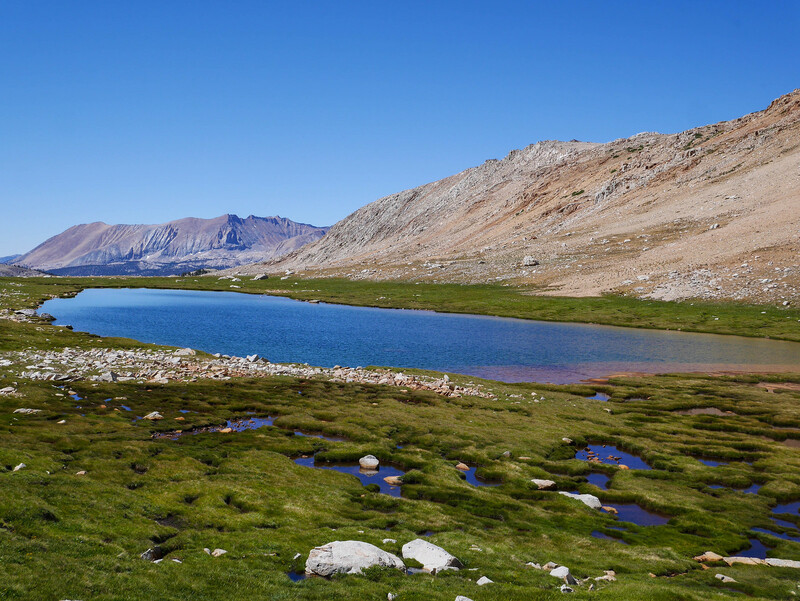 There is just something about these high tarn-strewn plateaus in the Sierra that gets me every time. 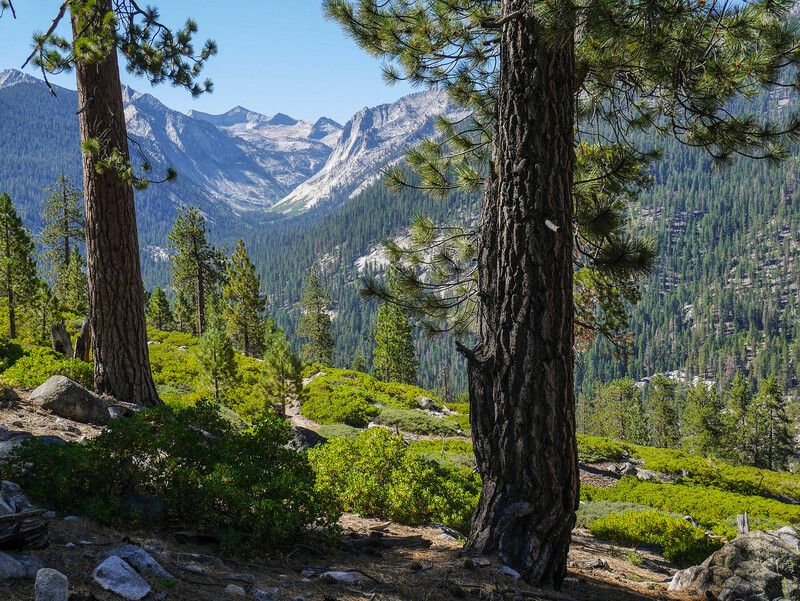 The cross-country travel is easy and there are incredible views of peaks off in the distance. 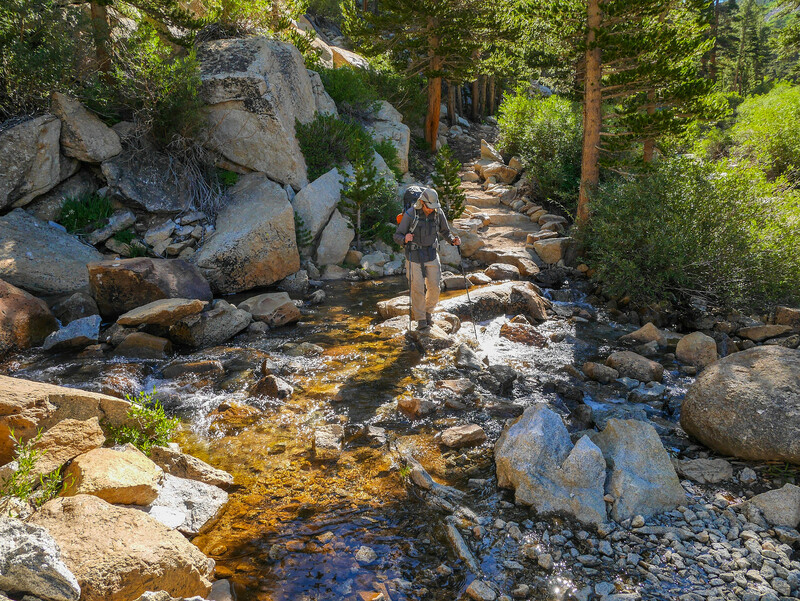 Knowing the power of the Kern River just a few miles south of here, it's so impressive to see the little trickles of streams at its source. 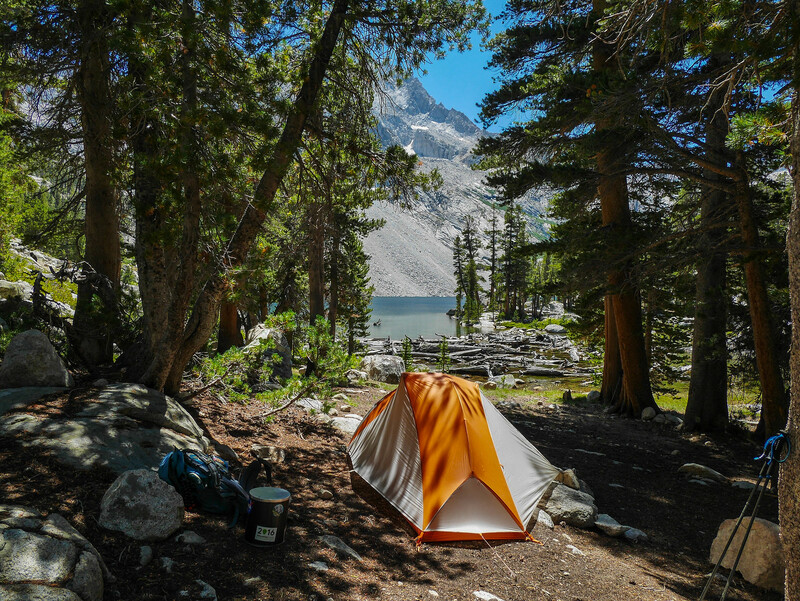 We made camp on the western shore of Lake South America, cooked up some grub, and passed out. I got up early catch the sunrise. 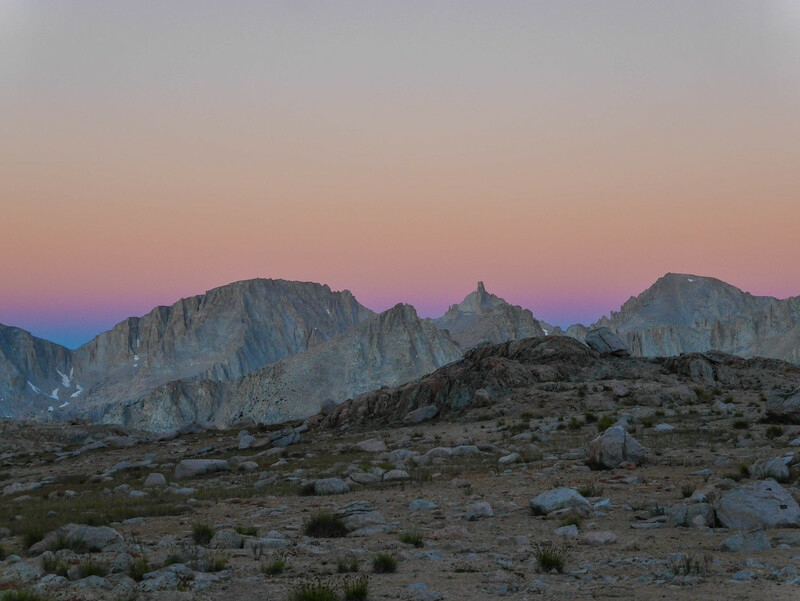 I am all about that alpenglow life and I thought our perch on a shelf above the Kern headwaters would give a nice view of that glow on the Kaweahs. I headed west about half a mile to the edge of the ledge and was rewarded with both gorgeous views and watching a sleeping buck wake up and walk off without noticing me. We planned a short day on this day, knowing that Harrison Pass would probably take a lot out of us. Good thinking, past selves. 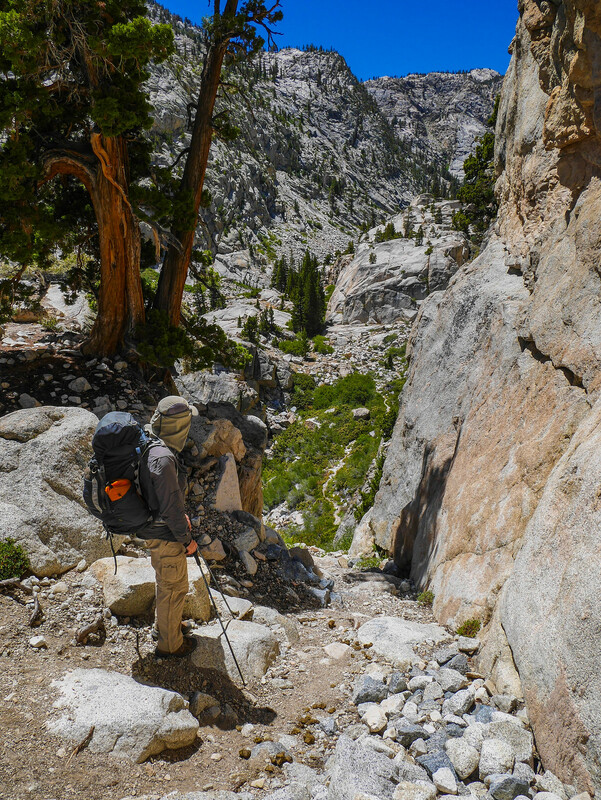 We got going at a leisurely 10am or so and headed south from Lake South America on a connector trail that meets up with the JMT. After passing a small tarn south of Lake South America, the trail pops over a ridge with a great view of the geography we'd be navigating in the next day or so. 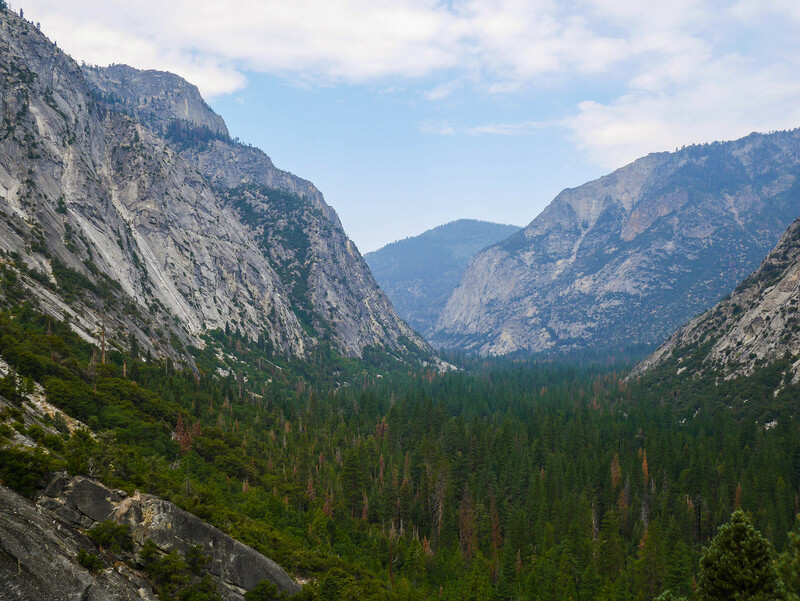 We could see the ledge ahead for the morning's walk, plus the forested valley of Tyndall Creek, and Kern Canyon beyond. We also had a nice view of Mt. Whitney as we descended. It's the flat-top guy in the middle of the top of the frame. 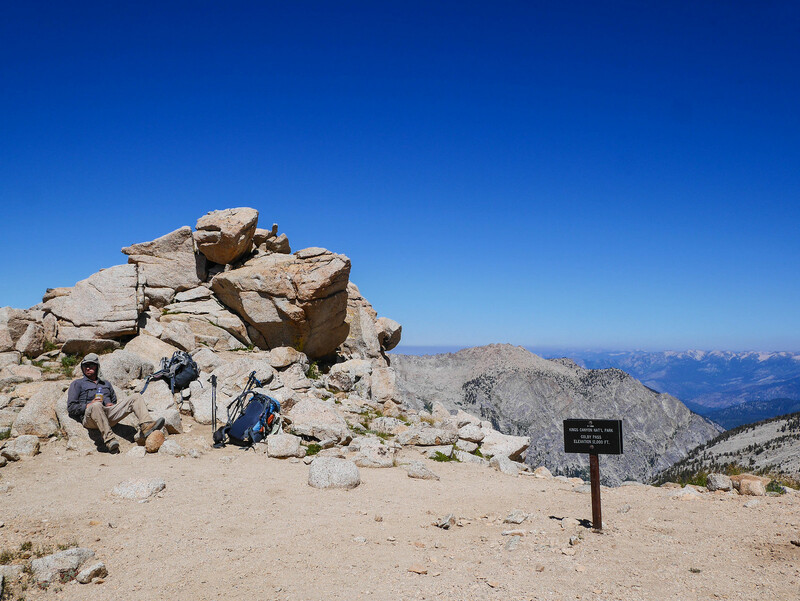 We joined the JMT for a mile or so and the steady stream of people we passed made feel a smidgen less self-pity for not being able to snag my own permit for that this year---our trip was prettier, harder, and we had it essentially to ourselves, harumph. 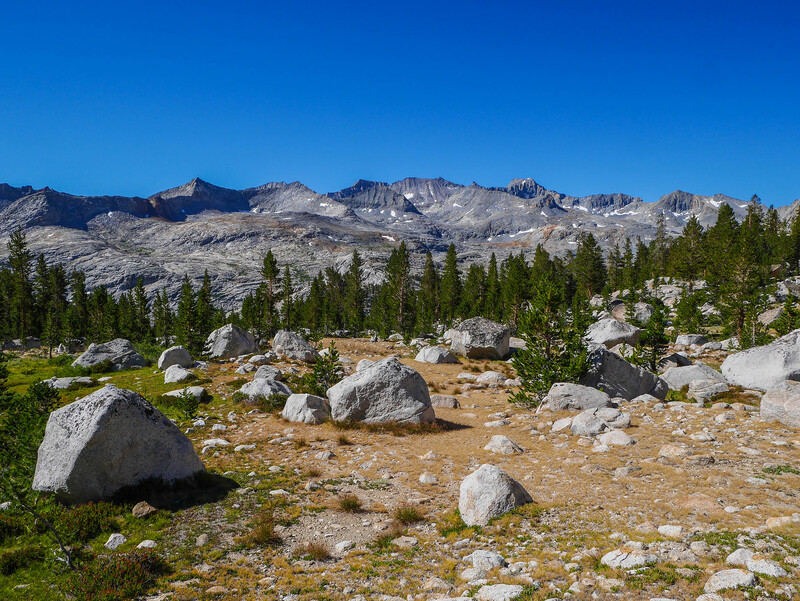 Still, the section of the JMT we hiked was pretty nice or whatever, I guess. 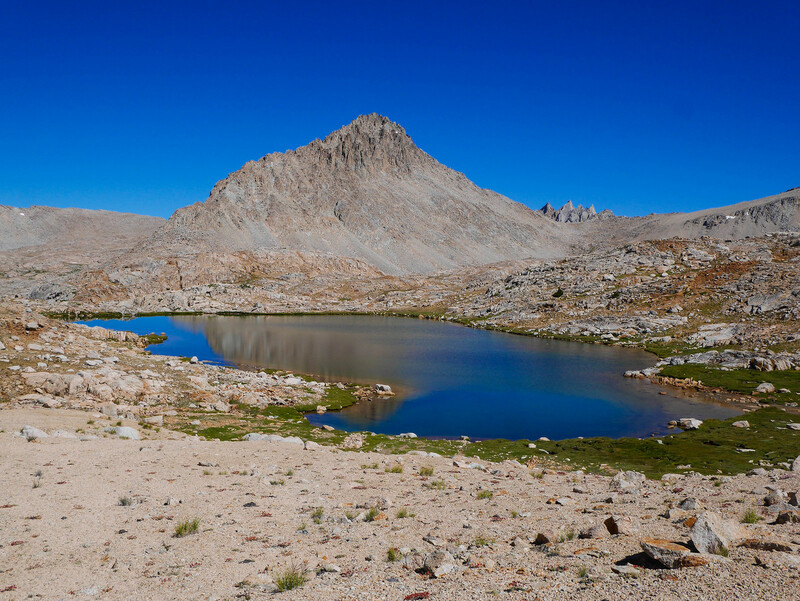 We followed the JMT up a small climb to where it flattens out near a little tarn. 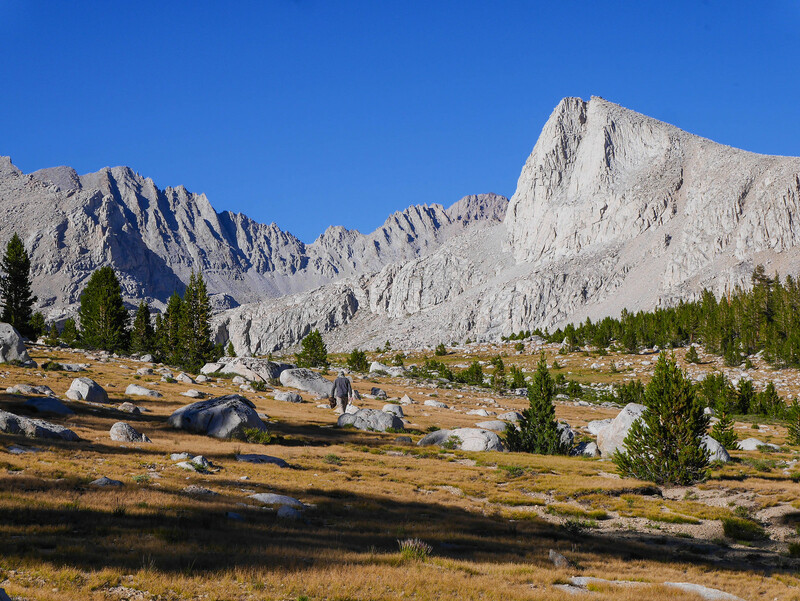 From there, we cut off the trail eastward, using Mt Whitney as a landmark for our bearing. Soon we encountered a bit of talus, though, so we turned south again to avoid it. 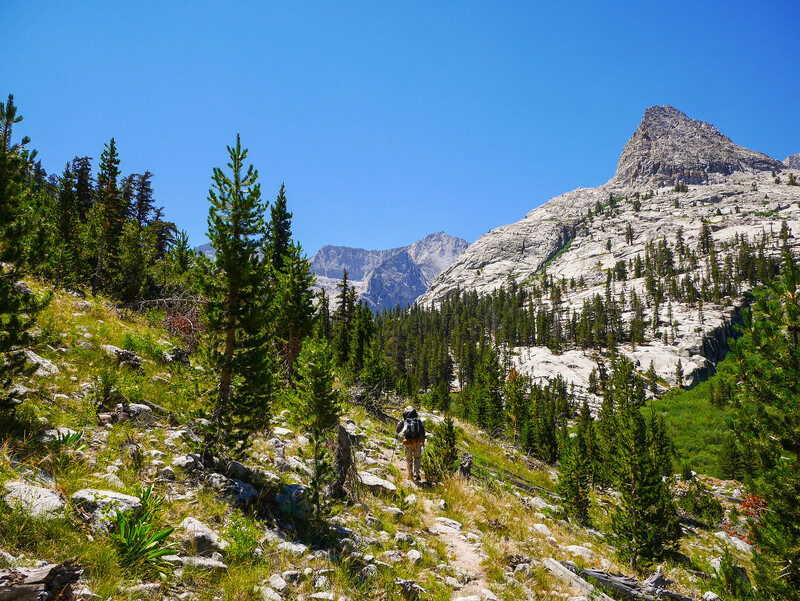 Without too much difficulty, we found our way down to the Bighorn Plateau. We made some deer friends at Wright Creek that runs through the plateau. 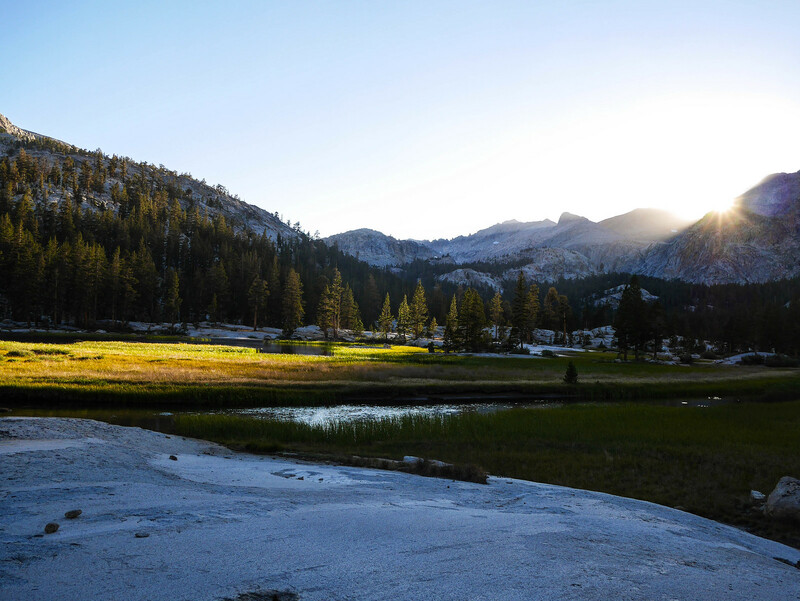 I splashed in the creek, we found a spot to camp along the edge of the plateau, where the meadow meets the forest. 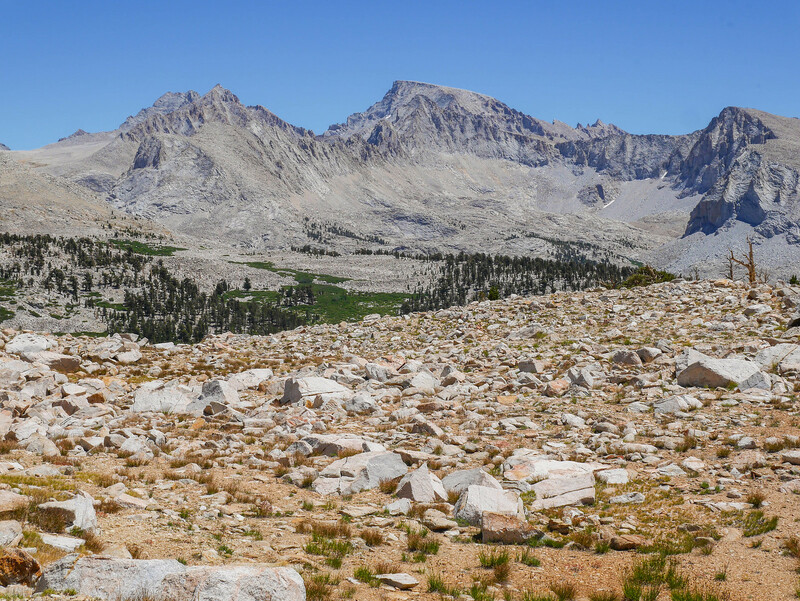 I had been wanting to visit the Bighorn Plateau again ever since I explored the area on a "rest" day that we took when we hiked the High Sierra Trail. 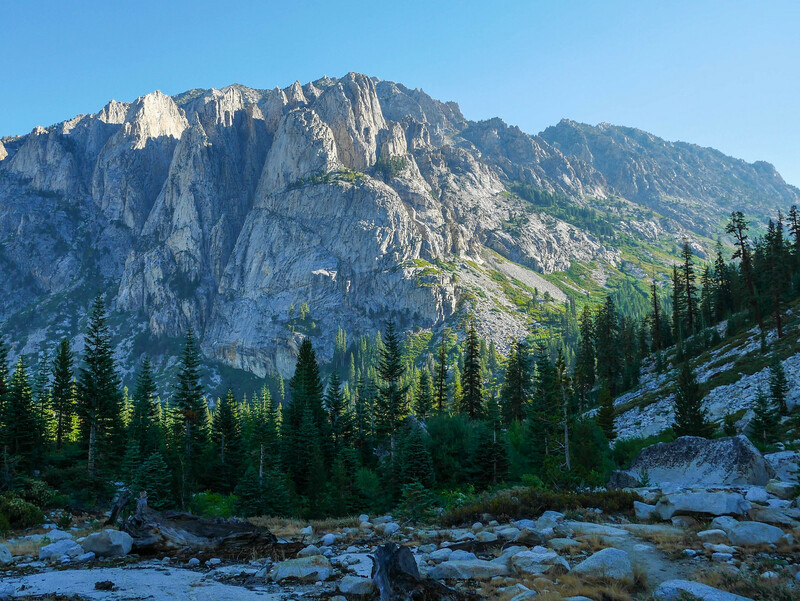 It's got everything I love: easy off-trail hiking, a lovely stream, expansive views of 13k+ peaks all around. 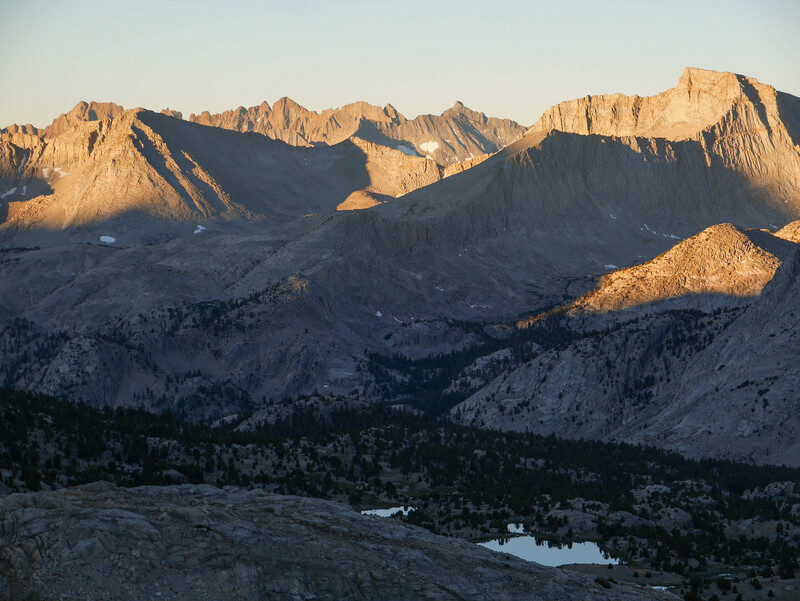 I mean, maybe I just have a little bit of thing for these high alpine plateaus. It's not like it's a problem or anything, though. I can quit anytime. 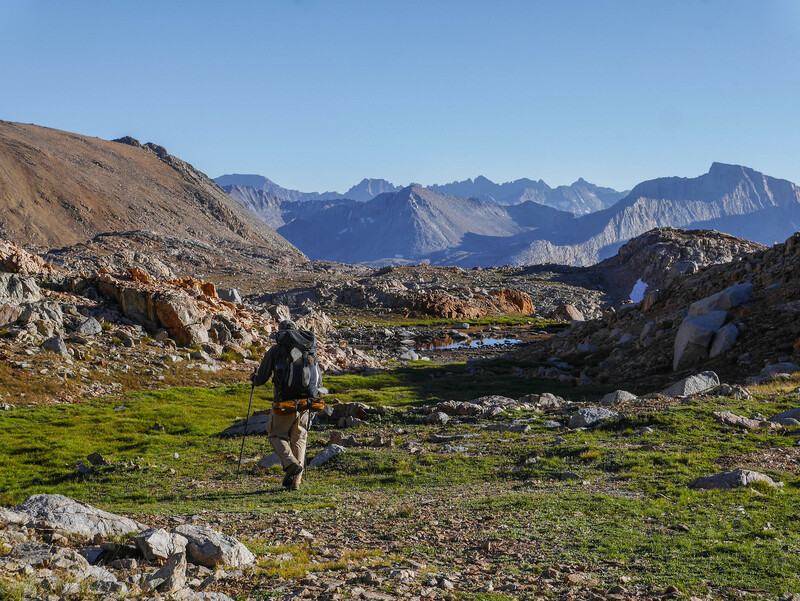 After resting for a few hours, we set out to explore the plateau, heading northeast towards Mt Tyndall. 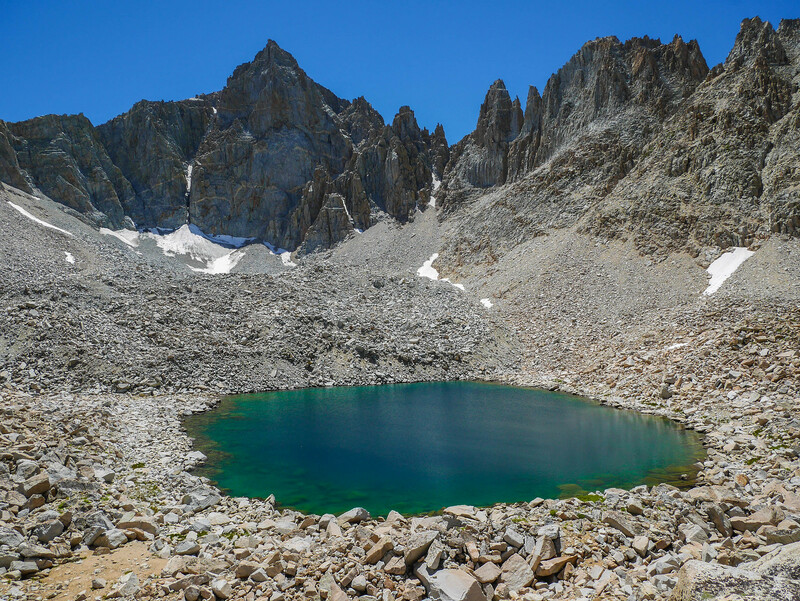 We puttered around a bit before turning back for dinner, wondering if it was the super dry couple of years that made the tarns the map showed elude us. 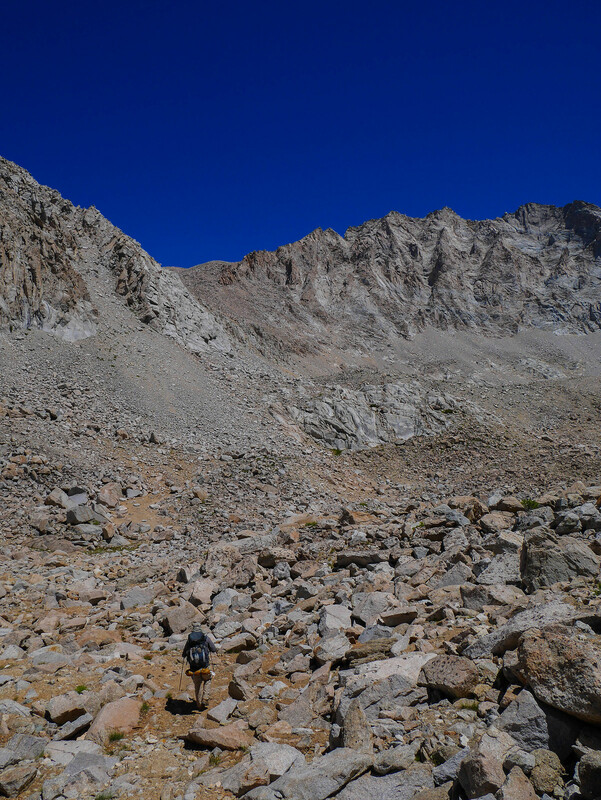 We took a different route back to the JMT than the one we had taken the day before, following Wright Creek mostly, staying a bit north and above it. 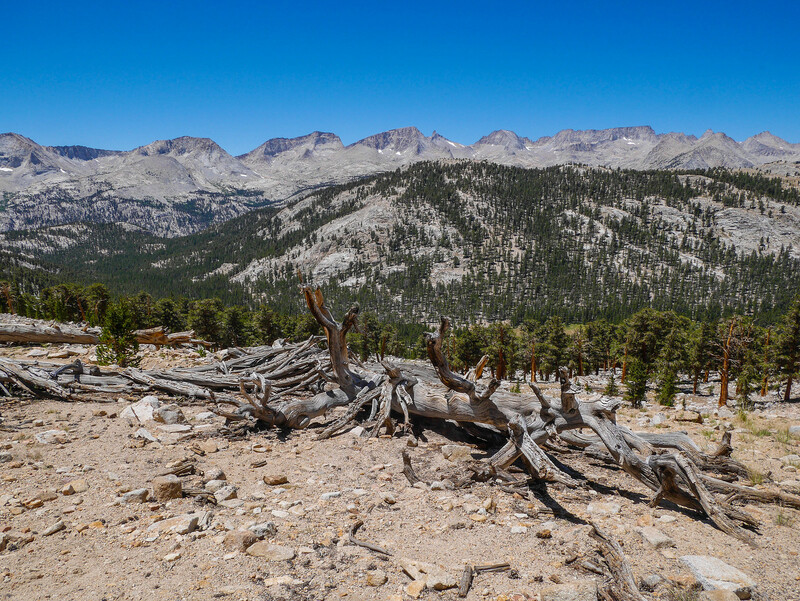 We met the JMT almost exactly where I had left it when I explored the area on the HST trip. The next several miles would be a repeat, in reverse, of trail I'd walked on that trip two years prior. 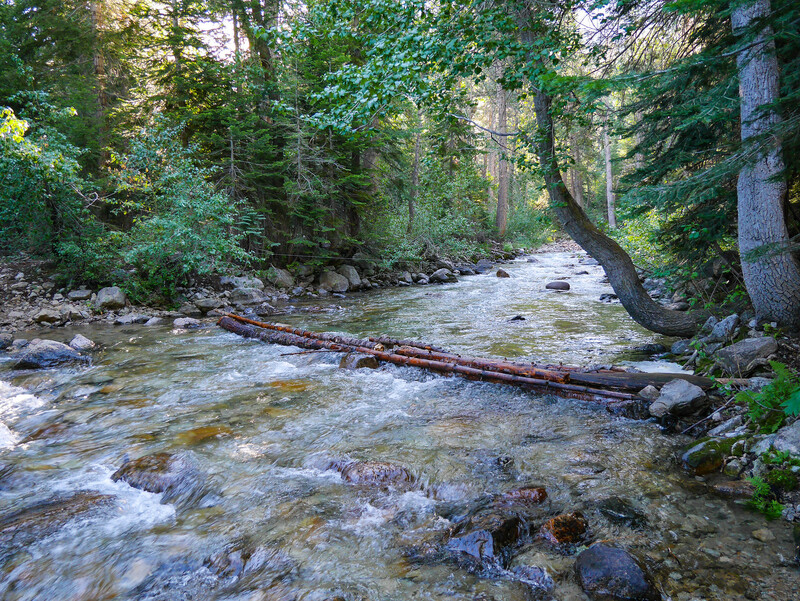 Last time I came to this crossing of Wright Creek, I lost my balance and dunked my boot in the water. I managed to keep my boots dry this time! 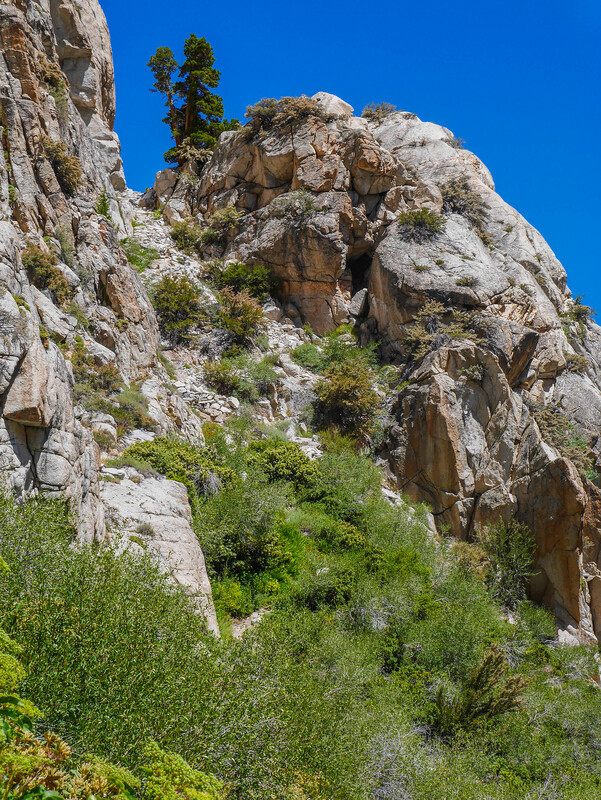 The trail descends several thousand feet down into Kern Canyon, with great views and impossible trees along the way. 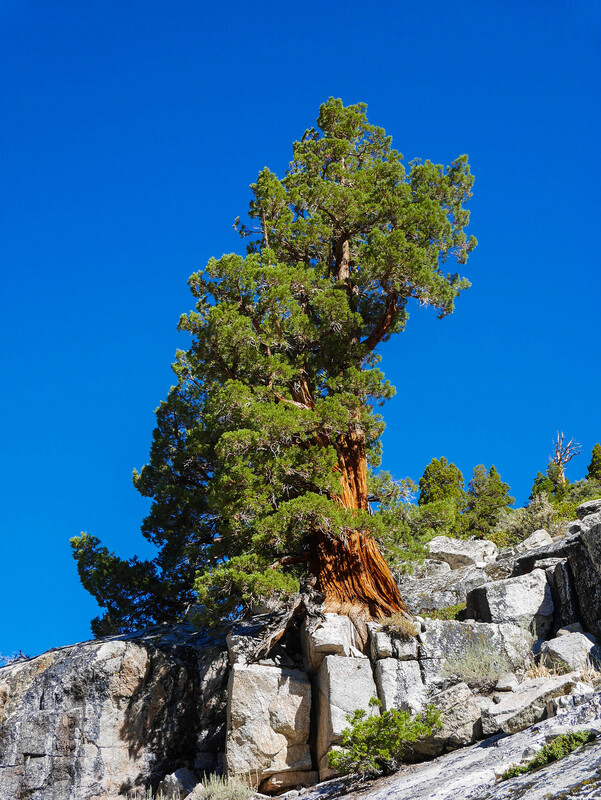 Like seriously, this juniper looks like somebody just came along and plunked it down on top of a granite ledge. 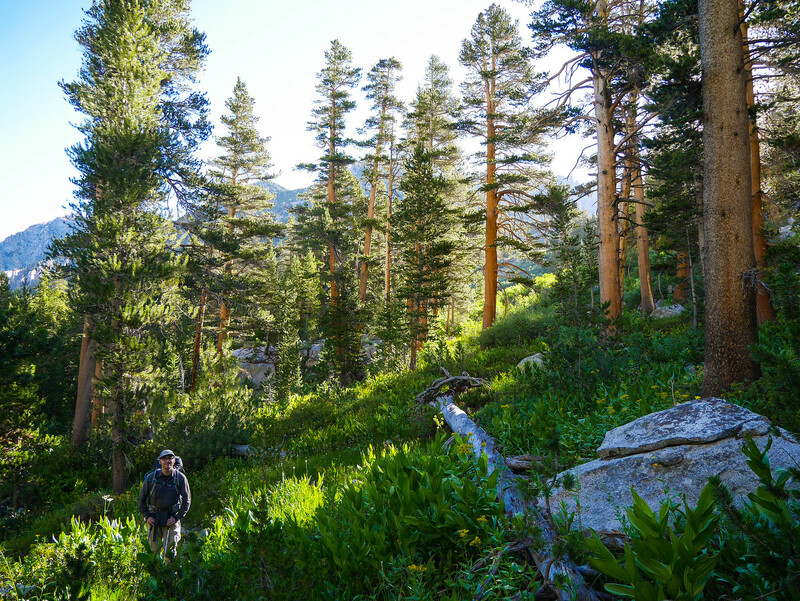 Down in Kern Canyon proper, the trail passes through a Jeffrey Pine forest where we found the junction to the trail west towards Colby Pass. Turning south at this junction would have taken us on a leisurely trip along the Kern River, but we were headed up up up again. 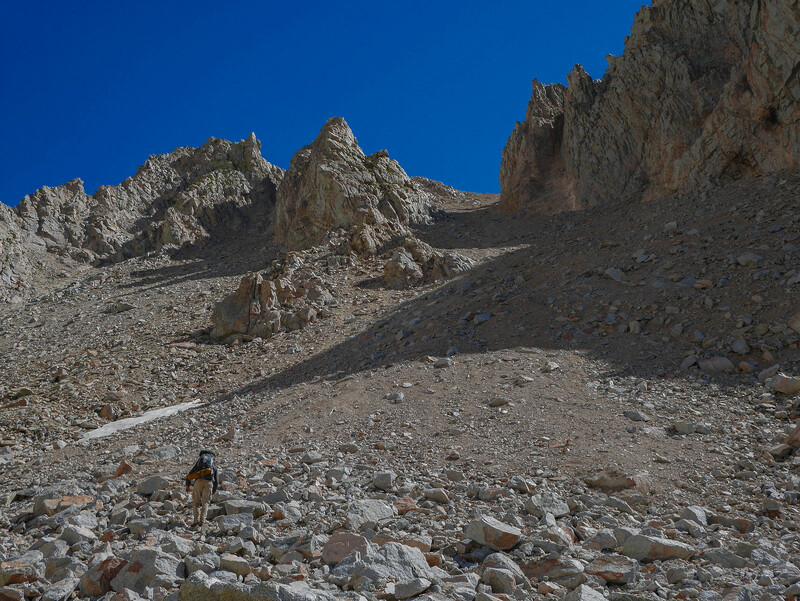 Despite making pretty good pace since the Bighorn Plateau, it was still just after noon when we started our ascent of the trail up towards Colby Pass. It was hot. Really hot. And pretty steep. Not the most pleasant hiking, but pretty nonetheless. 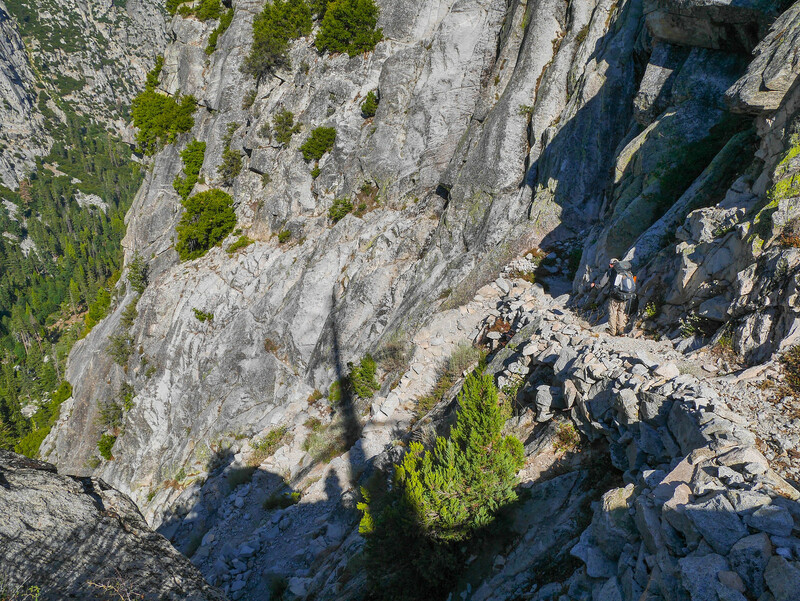 After climbing a thousand feet or so, the trail flattens for a nanometer before plummeting immediately a hundred feet straight down a cliff. Cool. I love to lose elevation we just gained. It's so inspiring. And hey, if you could make that trail basically giant switchback stairs, so it's extra annoying to hike down, that'd be super great! 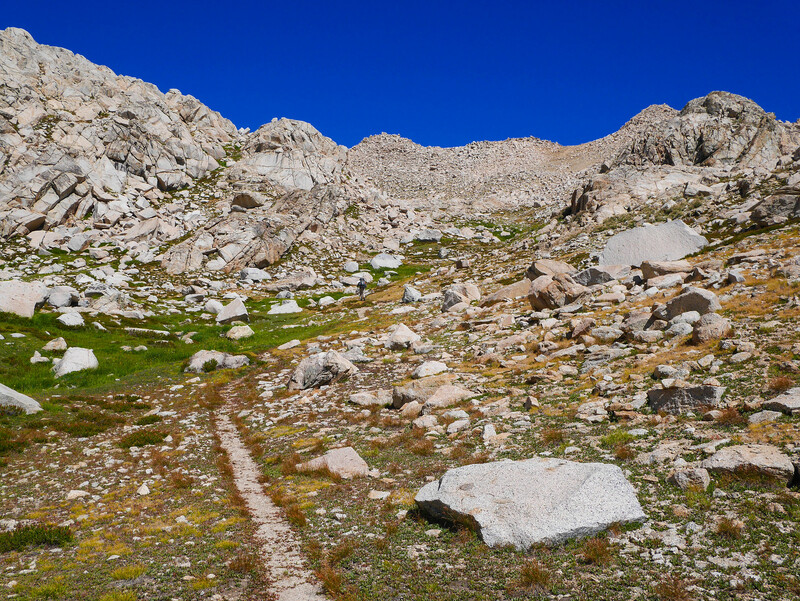 We continued up the canyon and the trail mellowed out to a reasonable rate of ascent. 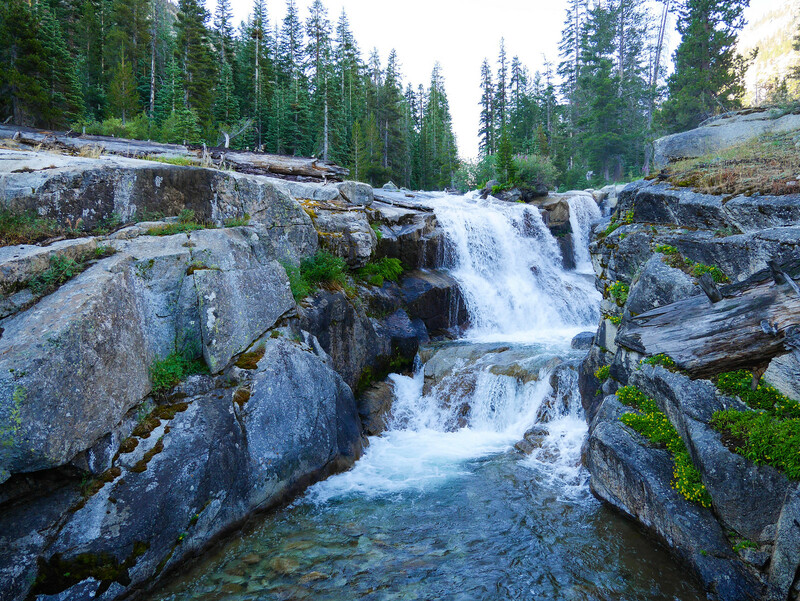 There were a few nice swimming holes and waterfalls, and some good views of the granite walls below Picket Guard. Eventually we made it to Gallats Lake, which isn't so much of a lake as a swampy grassland meadow where the Kern-Kaweah River makes a lazy horseshoe bend. We stripped off our boots and laid around on the warm rocks. Jason was definitely really clean, and not dusty or dirty at all, as you can see. We both got cleaned up and spent the rest of the day just being out. I reminded Jason it was Monday and we weren't at work. 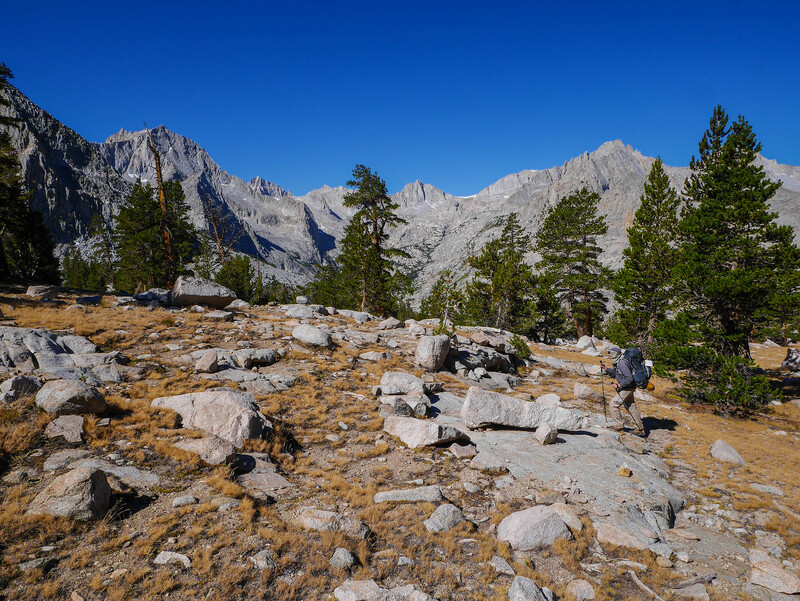 The trail continues following the relatively flat valley of the Kern-Kaweah River for a while before cutting steeply northeast toward Colby Pass. This day and the next I would have issues with being super tired on ascents. I think it's related to when I eat real meals vs snacks, since before we started this ascent I only had a granola bar. 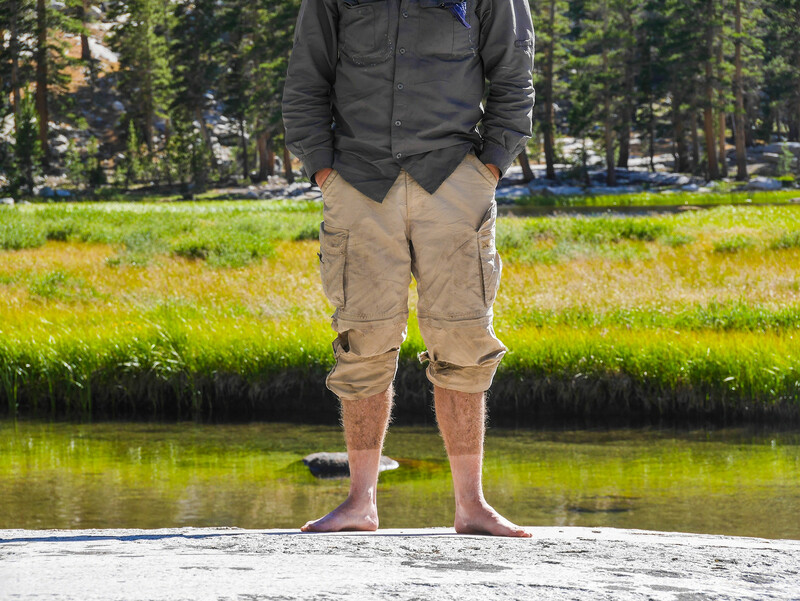 Jason mentioned that one of the reasons he journaled his trips was to figure out a better food schedule that helped him feel good all the time while hiking. I think I'll try that this summer. 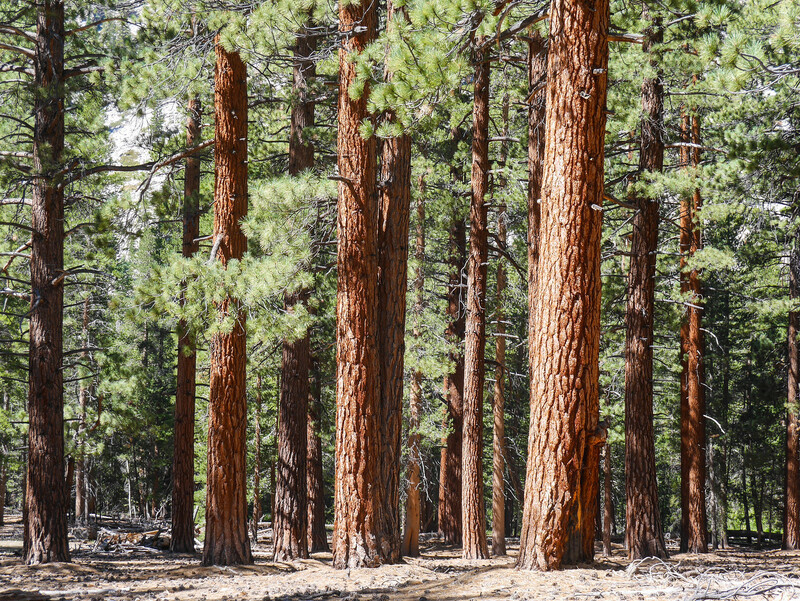 The trail climbs through the forest at first and then breaks out into a more open scrubland with gorgeous views of the Kaweahs. 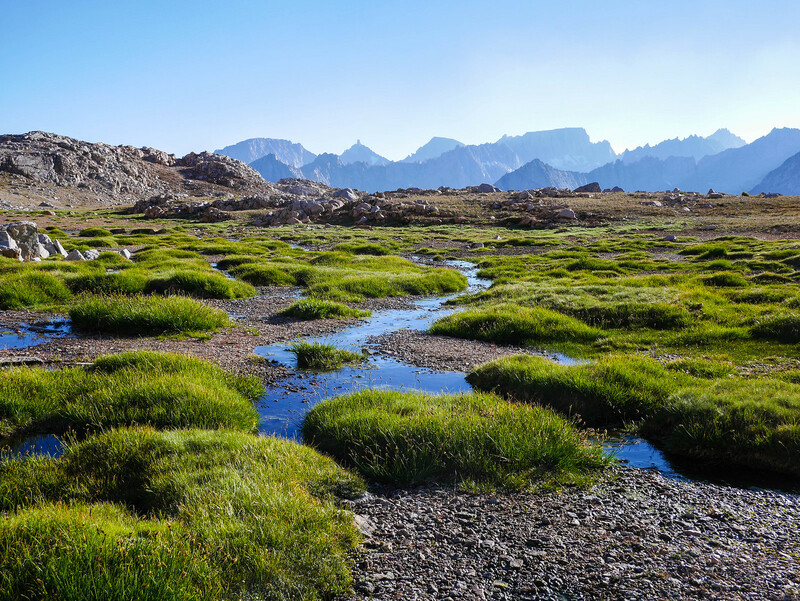 Colby Pass itself offers a fresh view to the north. We took a short break before descending the extremely steep engineered switchbacks on the north side of the pass. We made our way down to Colby Lake, where we stopped for lunch. 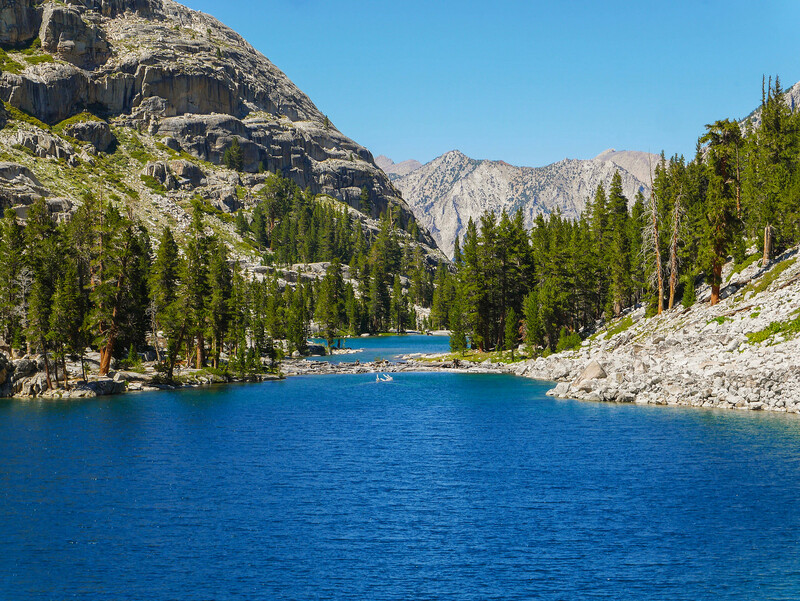 The water in the lake was exceptionally clear and we saw a lot of fish, so if you're an angler, this might be a good destination. 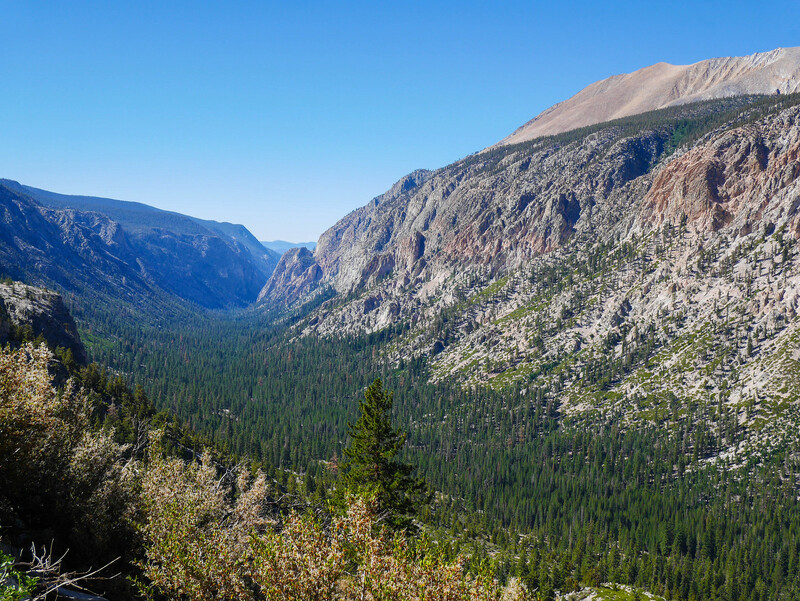 Both Jason and I were pleasantly surprised to find the next few miles of trail to be filled with wide open views of Cloud Canyon. I really enjoyed this section of trail, but somehow don't have a lot of photos to show for it. Maybe that's because Jason had my brain all wrapped up in trying to name the countries whose names when spelled in all caps in English have trivial fundamental group (read: no loops in any of the letters, so GERMANY is out but FIJI is in). Comment below with the ones you can come up with! 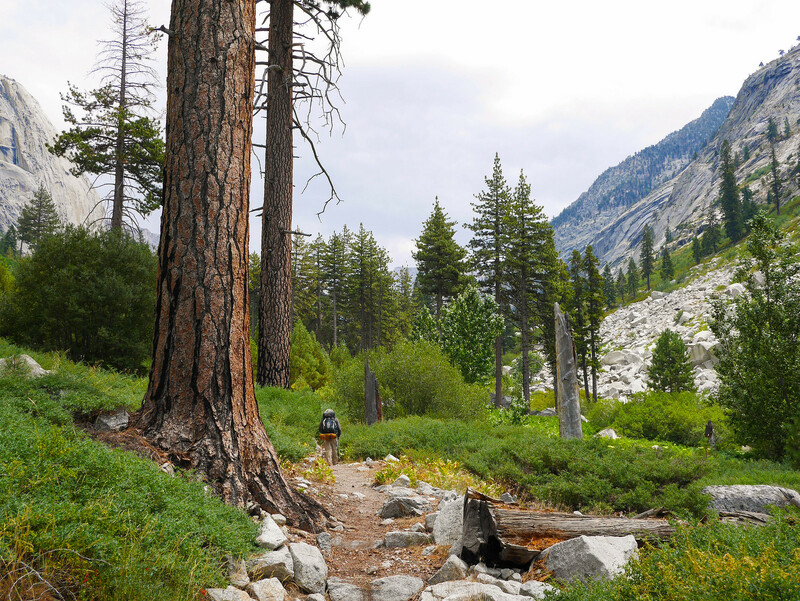 After a surprisingly nice several miles of big open views, the trail enters the forest north of Big Wet Meadow. From there it's trees trees trees. Pretty and all, but pretty monotonous and not optimized for blog-ready photography. 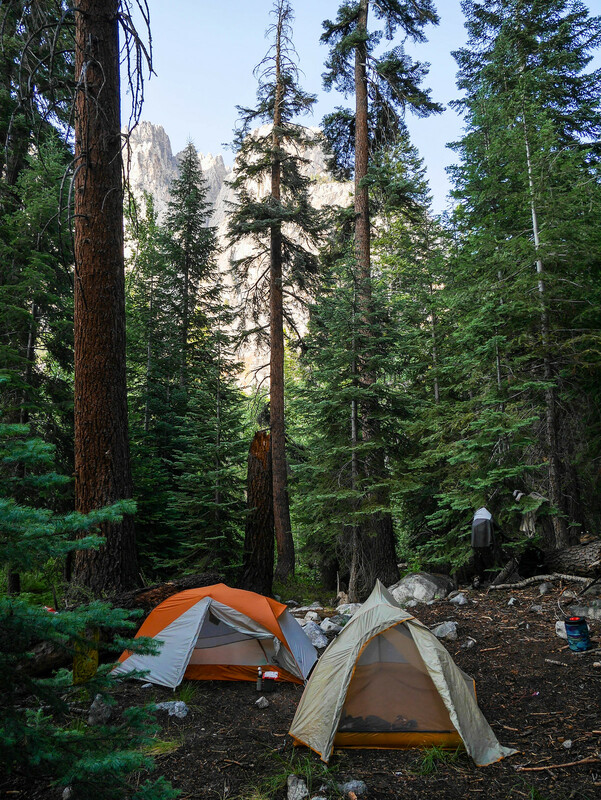 We camped at a pleasant flat spot in the woods just above the trail after crossing Brewer Creek. 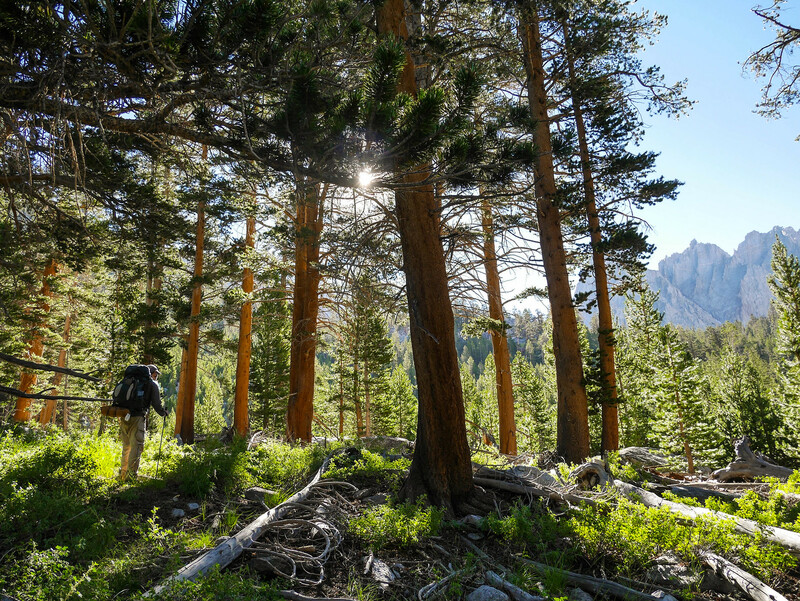 The morning was filled with more mileage in the woods down to the Roaring River ranger station, where we turned east to climb up toward Avalanche Pass. 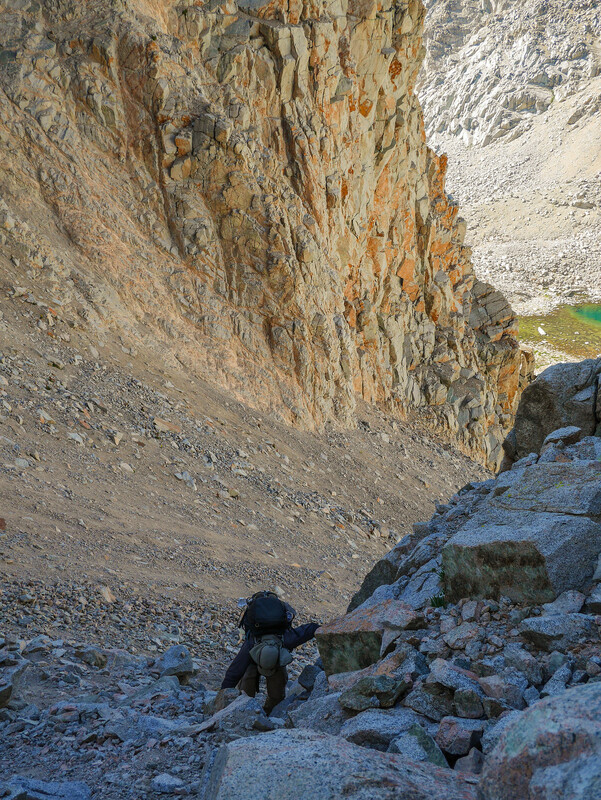 About halfway up we were treated to a fantastic view straight up Deadman Canyon toward Elisabeth Pass. The trail to Avalanche Pass is pretty unremarkable save for the fact that it's the biggest troll of a trail I've ever ascended. It literally DOES NOT GO over the low point where you'd think it's heading at the top. Instead, when you think you're almost there, the trail designers were like lol nope and they turn you back up the shoulder to the east. What the hell, guys. But someone who was there before us apparently needed to know what time it was. After a short break at the top of the pass, we headed down the Sphyx trail, which is notorious for reminding people who ascend it just who's in charge here. Hiking down it is no joke either, since we had to descend nearly four thousand feet in just over five miles. 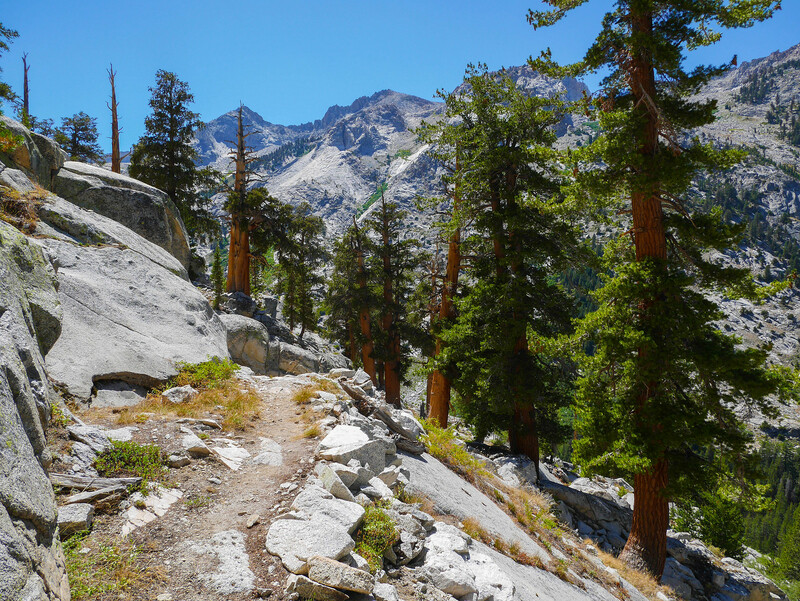 The trail itself is an incredible feat of engineering and even though it punished our knees and ankles with rocky ledges and steps, we couldn't help but marvel. We decided to camp one final night at the Sphynx Creek Junction on the Bubb's Creek Trail. It's the closest place to Roads End that camping is allowed and spending the night here meant we'd be able to hit the road for our drives home at a reasonable hour in the morning. 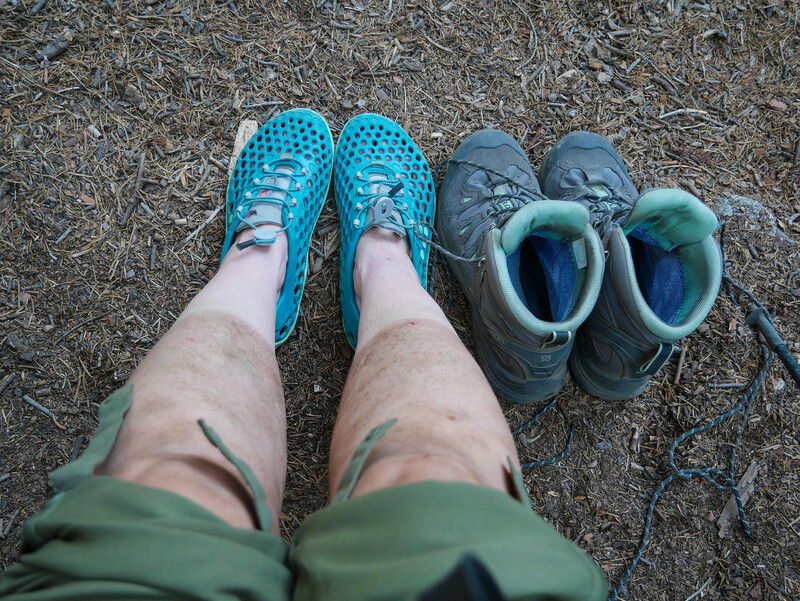 I was also really clean by this point. This was the end. We were so excited about the prospect of real food and legit coffee that it took us barely over an hour to reach the trailhead, even with a pause to make space for this buddy. Thanks for the trip report. 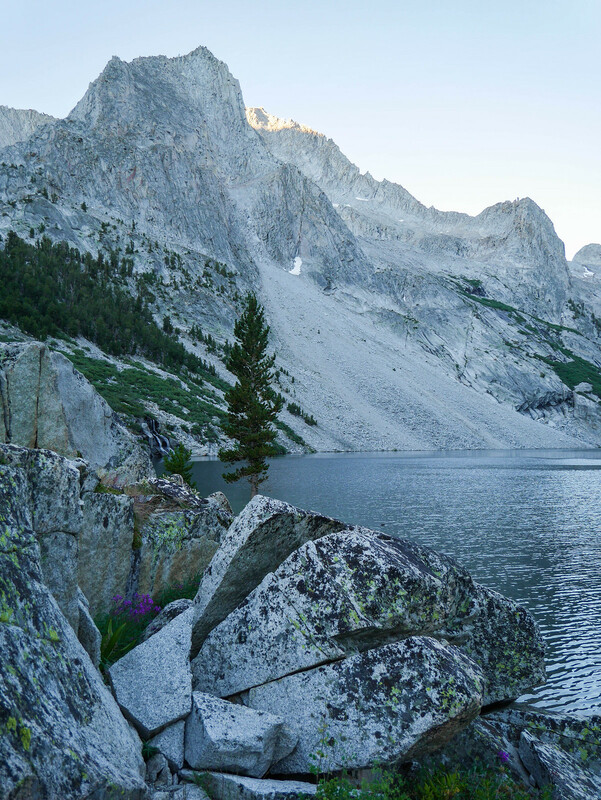 I was in the same area a few weeks after you at the end of August debating going over Harrison Pass from where I had camped at Lake South America. I'm debating the same thing as part of a different trip for 2017. 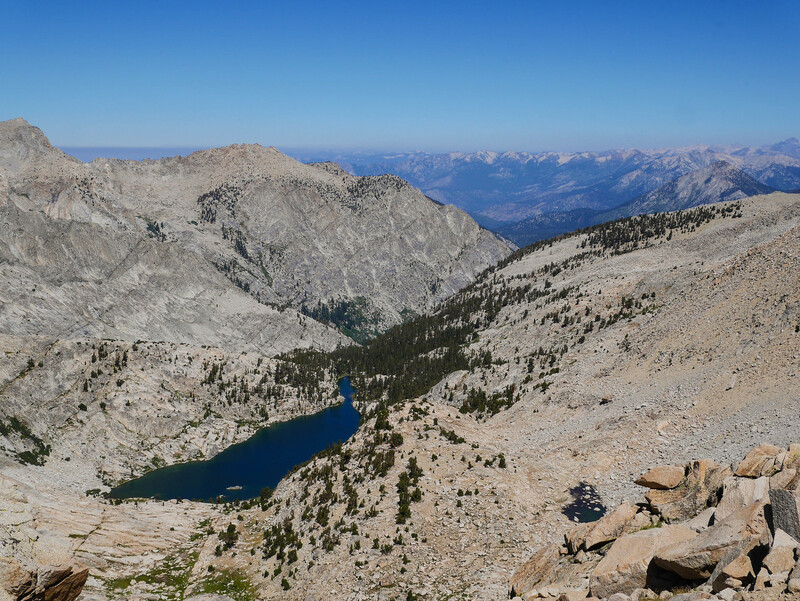 I ended up hiking over to the JMT and taking the long way around over Forester, down to Bubbs Creek, and ending up at the East Lake Trail Jct where I camped that night. I went up over Avalanche Pass headed south the next day, camping at Roaring River Ranger Station. I have a picture of the same section in your last pic of the trail up the Sphinx, only I was headed up towards it. I'll post my trip eventually and try to remember to include that pic. 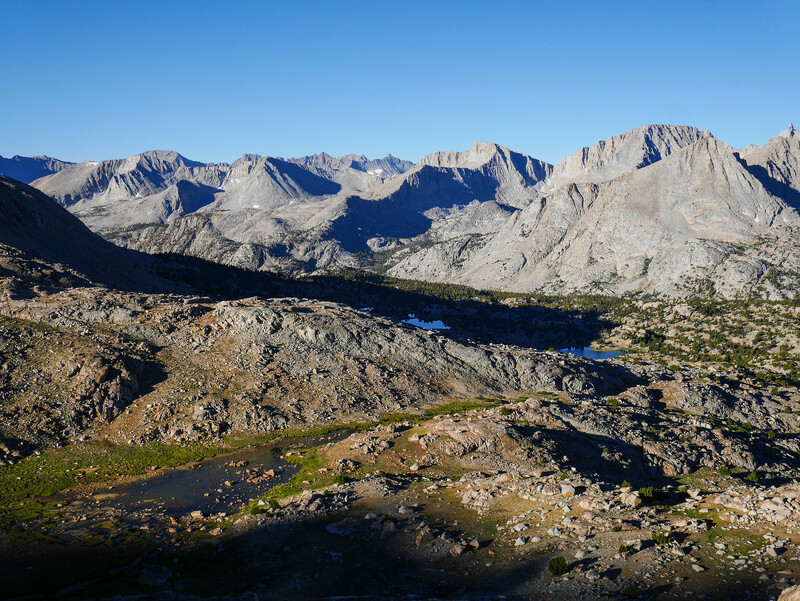 The most beautiful parts were the Big Arroyo from Kaweah Gap, Lake South America, and that small bit of trail between Lake SA and the JMT. 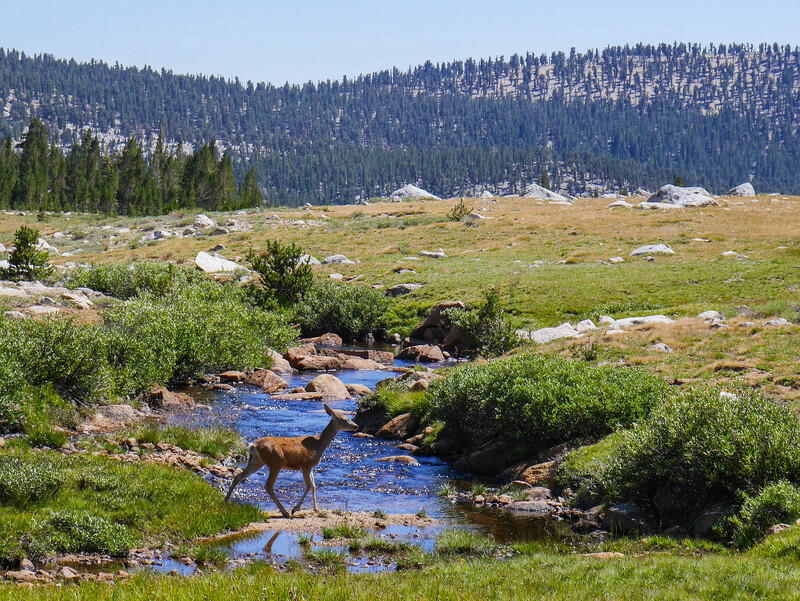 I did see a buck and doe as I was headed up the Kern drainage towards Lake SA, but didn't catch any awaking for the day. 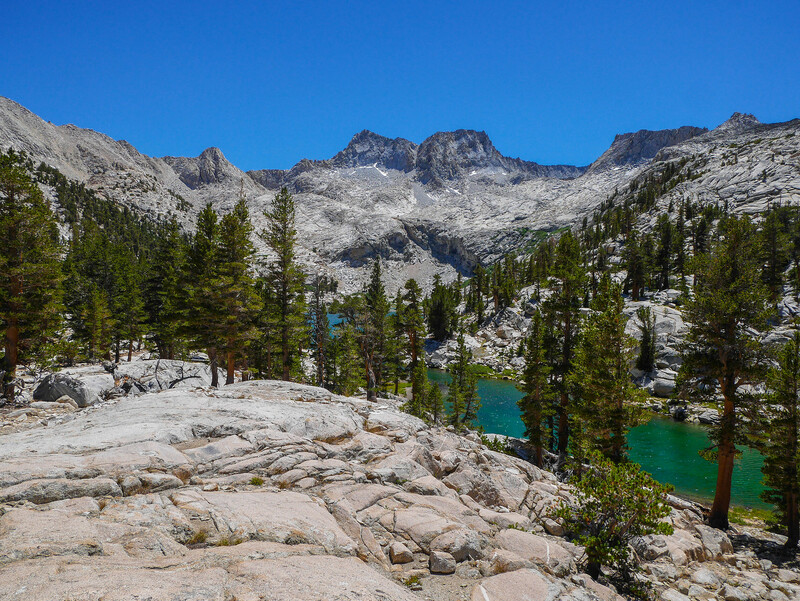 I really enjoyed your photos and report of one of my favorite routes in the Sierra. You and Jason covered a lot of miles some of the days. Harrison Pass really is a horrendous climb. I did part of it crawling up on all fours like a spider. I guess the big duck/cairn at the top is no longer there. 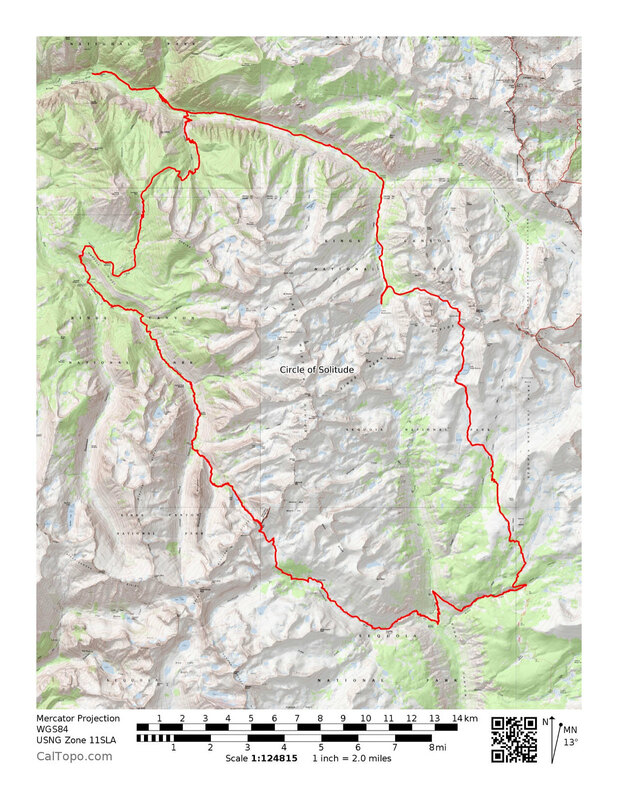 That bit on the Colby Pass trail when it goes back down really is annoying and nasty. Thanks for sharing a marvelous experience. I totally agree, that area is so amazingly beautiful. LMBSGV wrote: I guess the big duck/cairn at the top is no longer there.. It's still there---it's what was holding my camera in our top of the pass joyous selfie! Great TR! 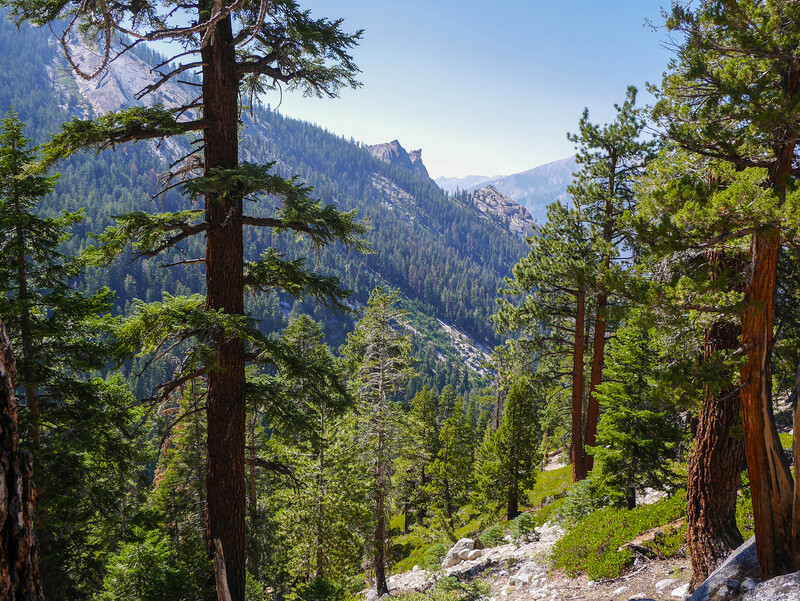 Looks like an incredible hike. I have it on my bucket-list (sans Harrison, if you can imagine). Your shot of Milestone in the morning light is absolutely incredible! 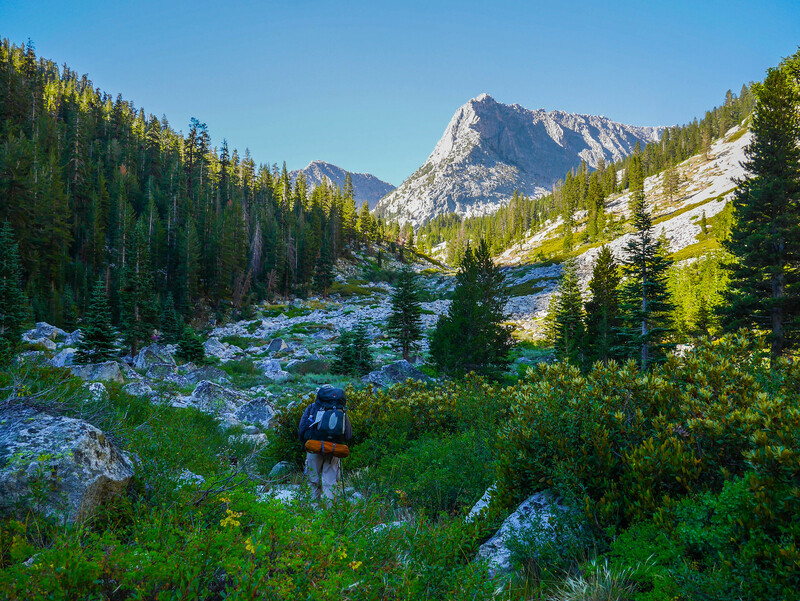 "The mountains are calling, but can't find my phone"
A very nice trip report! I've thought about taking this trip often. 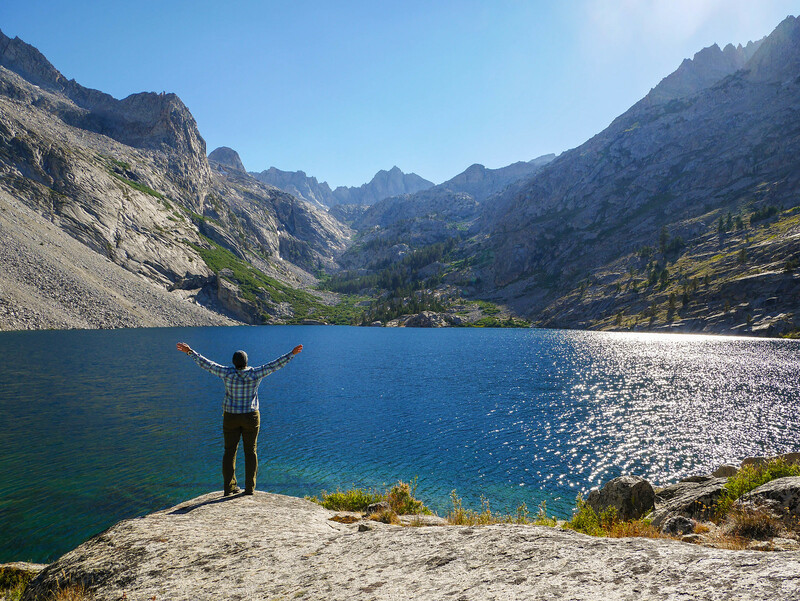 I hiked up to the foot of Harrison pass when I was camped at Lake Reflection and always wondered whether I could/would return to do it one day. But you have have reinforced my growing suspicion that it is beyond my comfort zone. 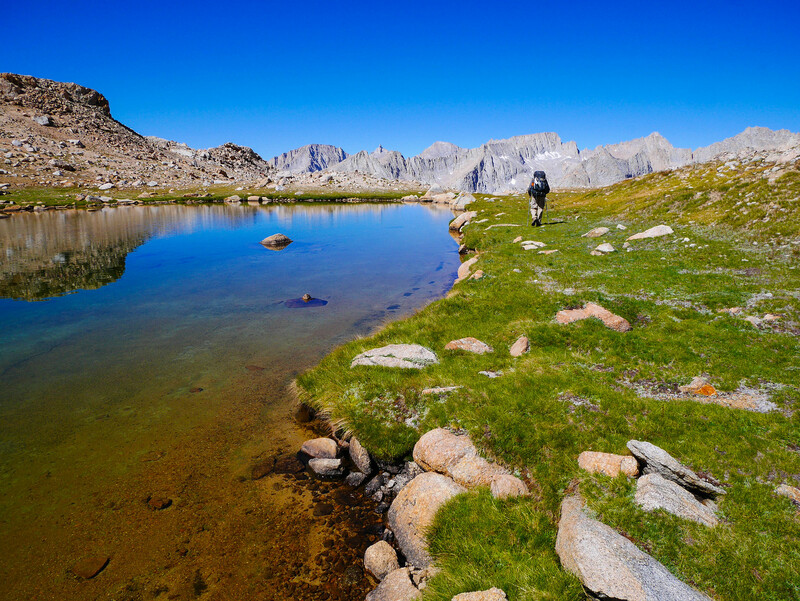 By the way, when we went up to the tarns below Harrison we went high on the north side of the outlet stream and dropped down slightly to the first tarn, avoiding all the brush and avoiding the stream crossing until almost directly at the outlet. It worked out well for us. An 8-day trip with over 17k of up vertical is a quite strenuous effort. Looking at your map, I would tend to cover those areas over at least 4 different 9-day trips. 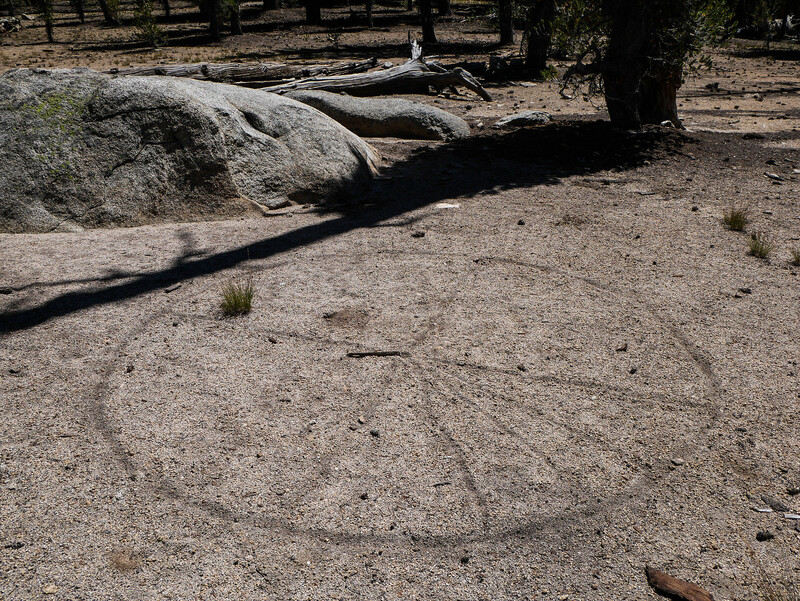 But you two were repeating the Circle of Solitude route. Notice all your images are 1,600px × 1,202px (HST scaled to 759px × 570px) (or portrait so) as is on your blog. Would expect you are using a camera with much more resolution than 2 megapixels then downsizing to that practical web size but oddly never cropping for best aesthetic? Generally you have an excellent group of aesthetic images very well exposed. On some of your images can see the fine job you did lining up foregrounds. Well done! And quite enjoyed your well written accompanying text. Thanks for taking the time to craft a fine report and sharing. 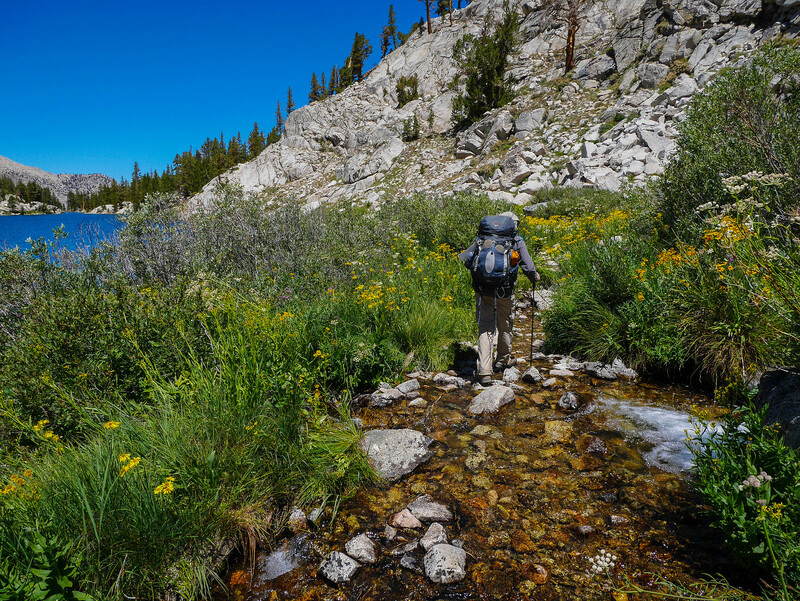 In 1993 we backpacked up the East Fork to below Harrison Pass but not further areas on your route. 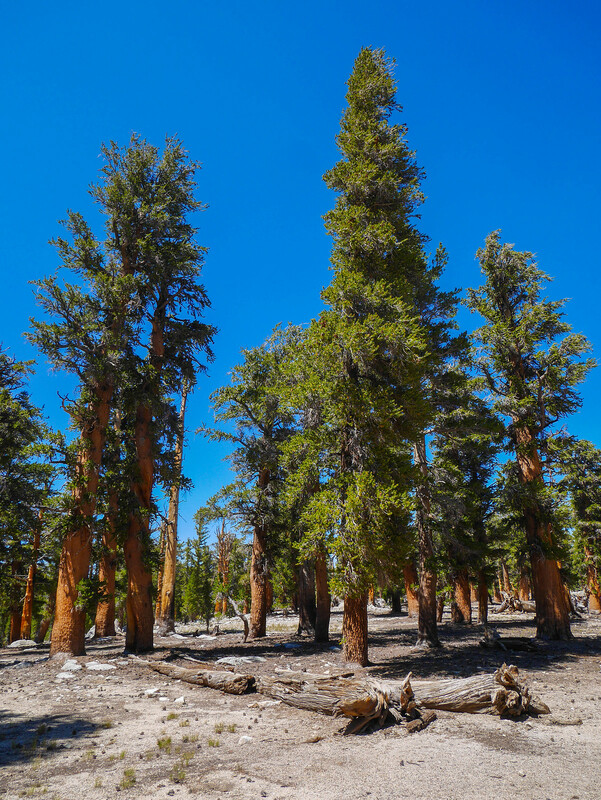 However I have an extensively detailed 10-day trip queued up for the Upper Kern Basin areas including much Google Earth work so was instantly familiar with many of your images. Our own experience was until one reaches East Lake at the end of day 2, rather modest landscape aesthetics down in a deep glacial U-shaped canyon. We didn't camp at Reflection Lake that has many fans although we did visit the lake for a couple hours one morning because it is in such an enormous hole. 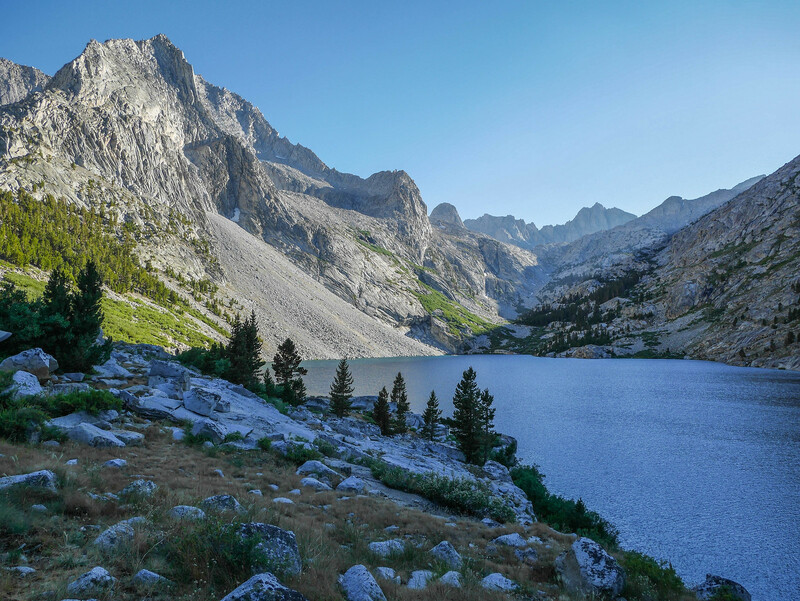 Too shadowed until the sun gets so high up that light tends to be harsh and landscapes behind the lake have much middle ground canyon slopes despite the interesting peaks at skylines. At East Lake, thought the better aesthetics were up on the granite slopes above well west of the lake where peaks to the east are more visible. We spent 3 days on the bench where you wrote:. 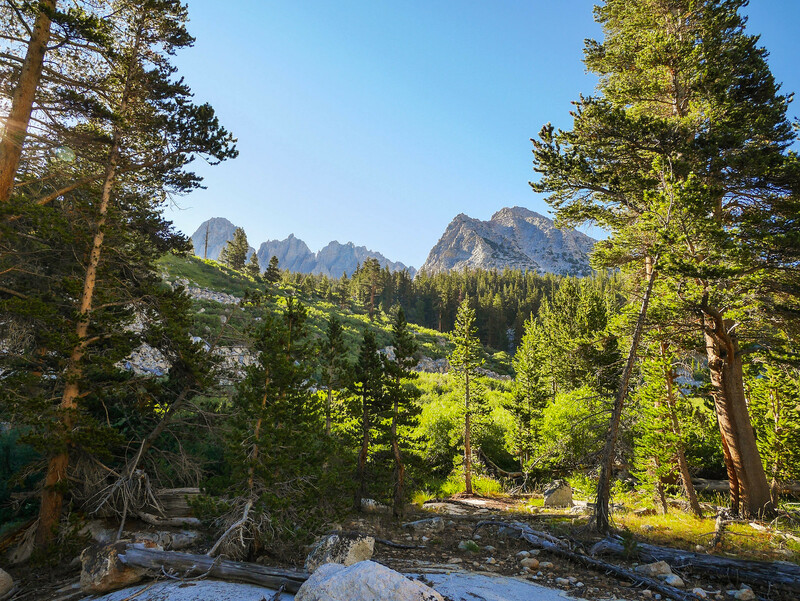 Your following image with the pond is a particularly fine area with a lot of wildflowers at peak season and slopes covered with impressive foxtail pines. 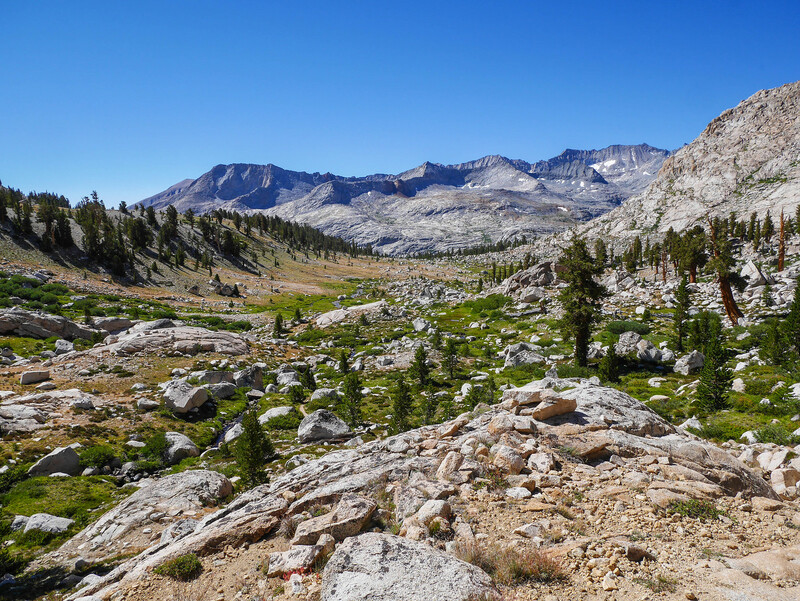 In your image near frame center is a bare granite knob. Some cretin earlier that summer had built a large bonfire atop it apparently with every large piece of wood they could find in the near area. One of the worst such pyro moron creations we've ever come across. Took us quite awhile to dissemble and scatter it all. We did climb up the stream into the background but once at the knee, the upper areas as you two found out is just an unpleasant talus bowl. 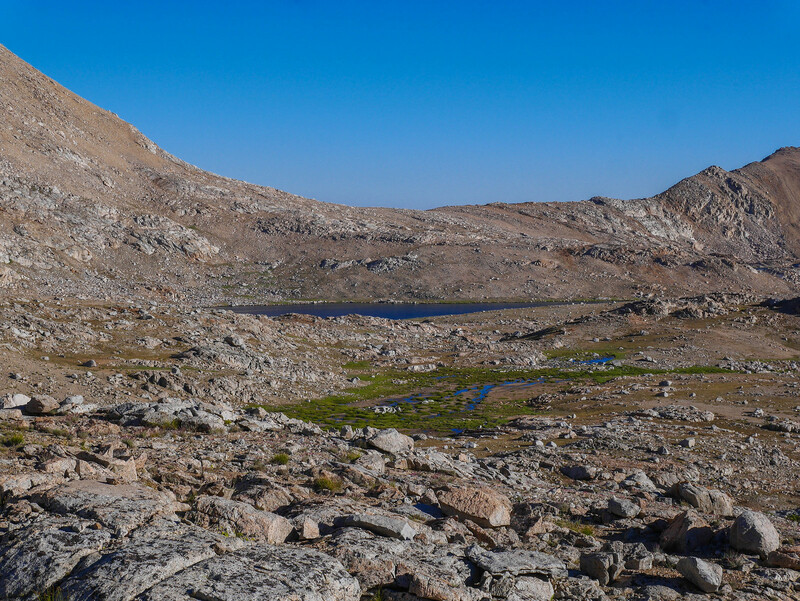 The majority of visitors to the Upper Kern Basin tend to target the barren alpine flats about Lake South America at 3641 meters for a camp spot and often a layover however on my trip will instead camp down below at timberline about the many no name lakelets to the southwest at 3420+, a more central location for exploring that basin with more balanced views of surrounding peaks. Very nice dawn night wedge sky color image over Milestone Mtn. The lakes on the expansive bench you passed in 29099464572_456cebc746_h.jpg and 28586868553_025ed5d52a_h.jpg is an area I hope to work. Superb situations for dusk sky color to south. 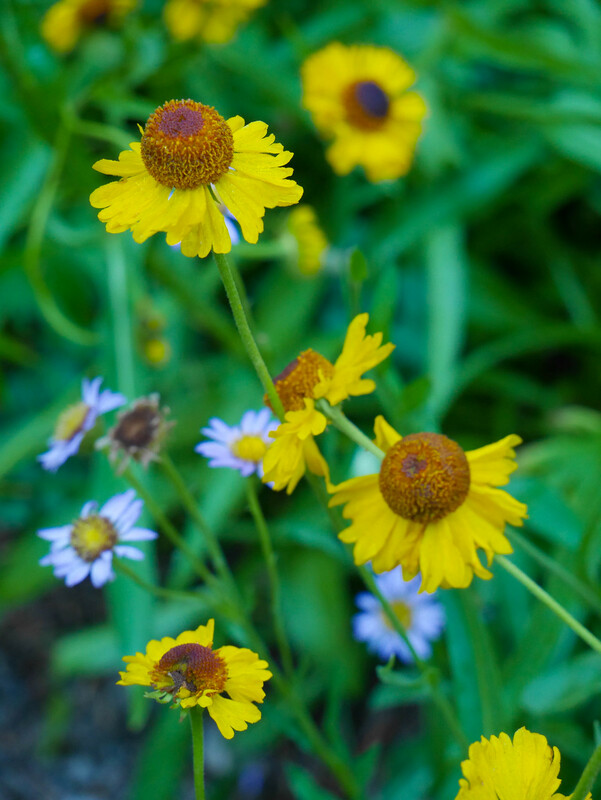 With the deep snow pack this winter, those areas this mid August would be optimal with more green and wildflowers. Am expecting Maverick's 2017 group meetup the last week of July west of Taboose will be too early for peak greenery and wildflowers. 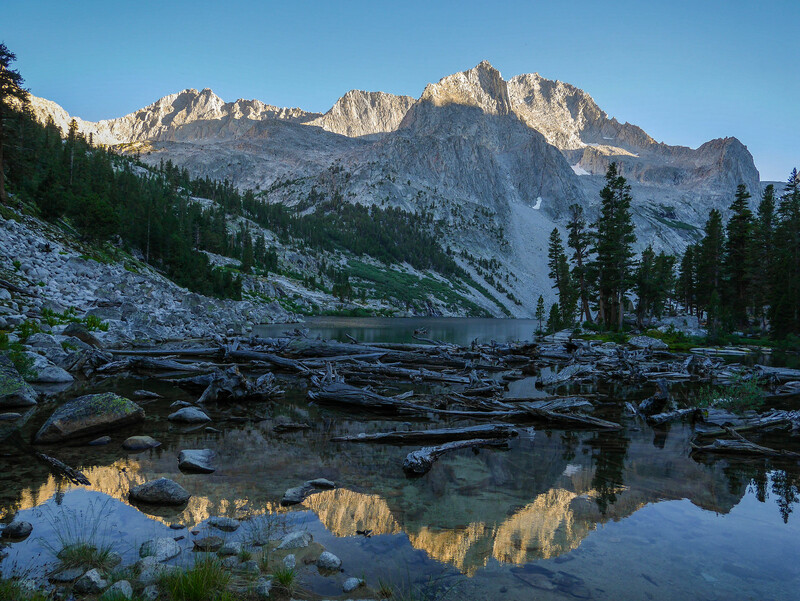 I had mulled linking up there with others but won't do so now and instead may move our Humphreys Basin group trip to the first week of August and then follow that with my 10-day noted trip over Shepherd. 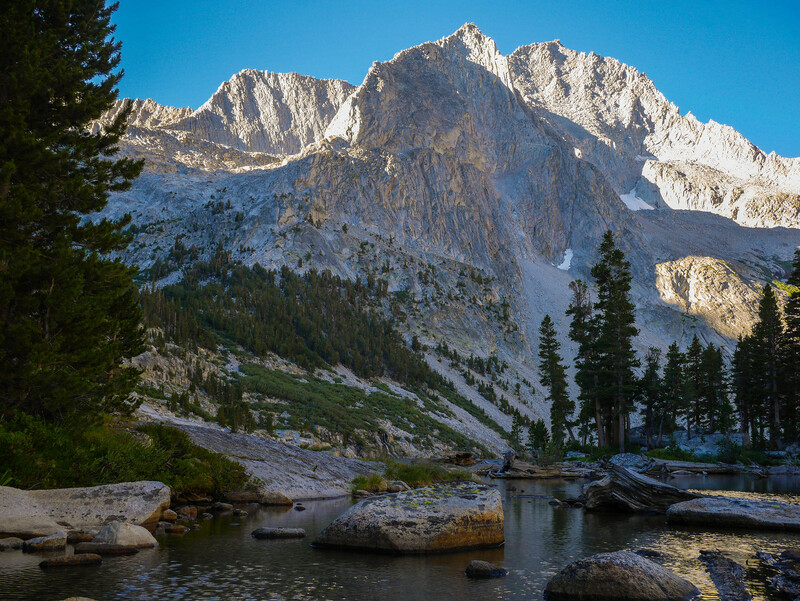 Throughout the range, the deep snowpack will mean more aesthetic northern exposure snow fields gracing high peaks so the Upper Kern may be as good as it ever gets. 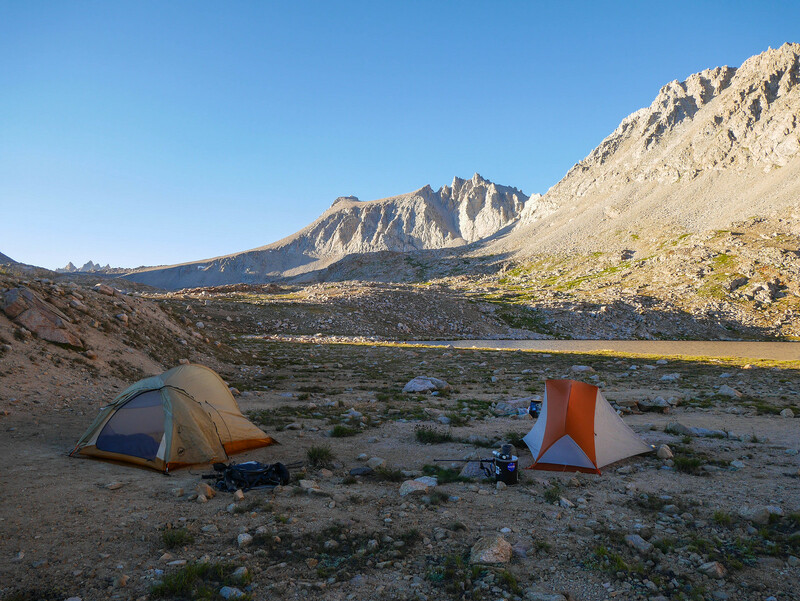 Instead of base camping down about Wrights Creek meadows, I will be up atop Bighorn Plateau well away from the trail where views are rather expansive in all directions and will be much less mosquitoey that is likely to be a serious camp spot selection issue through this coming summer. 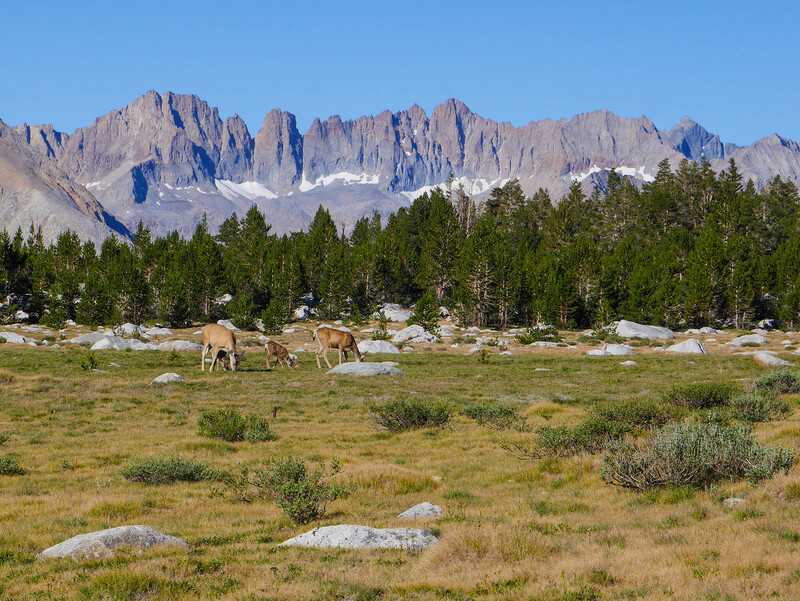 Very nice image of the 4 deer with Kaweahs behind. 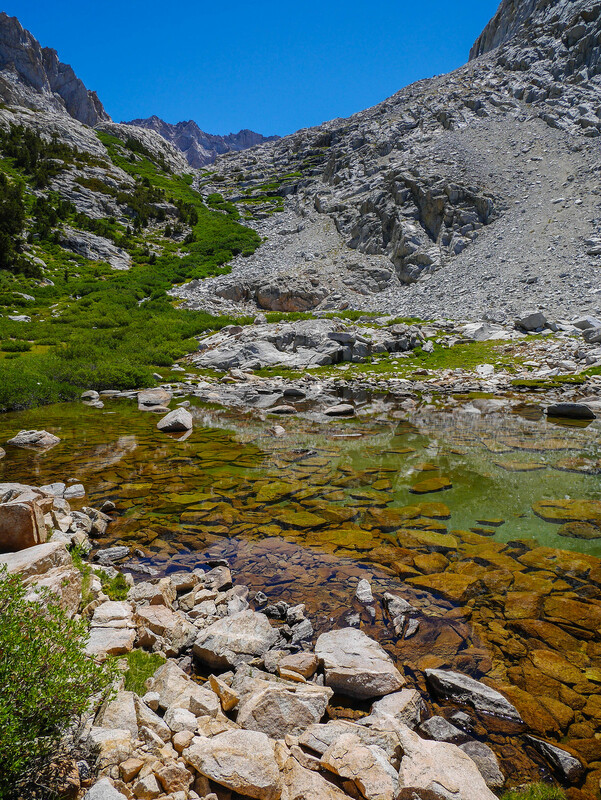 Thanx for the really nice photos - especially the ones of Harrison pass. You might want to consider adding them to the Harrison anchor post here: viewtopic.php?f=31&t=7712. I think anyone researching the pass would really appreciate the perspective you were able to capture. Thank you for the beautiful trip report. It brought back memories of my 1986 trip that I did with just couple of variations. Like you we went up Bubbs Creek but all the way to East Lake on the first day , pretty grueling for one day, Rested on the second day. 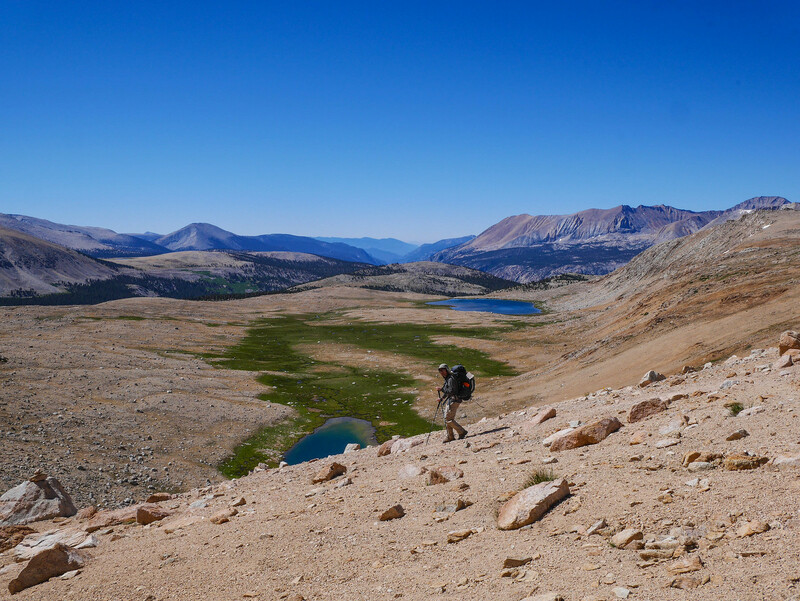 On the third day we went over Milly's Foot Pass into the upper Kern all the way to one lake below Casper lake. The last 100' of Milly's get pretty interesting with a pack on. 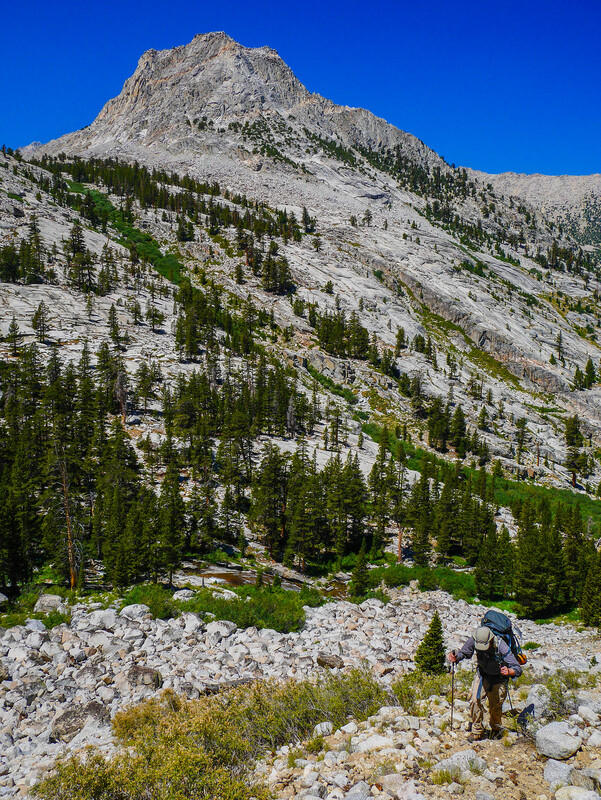 On the fourth day we went cross country up Milestone Creek and camped among the granite slabs in that drainage. On the fifth day we went over Milestone Pass and then on to Colby Pass. After that we took 2 days to go out over Avalanche Pass and out. Would like to try it again just to see if I could still measure up to my 25 year old self. 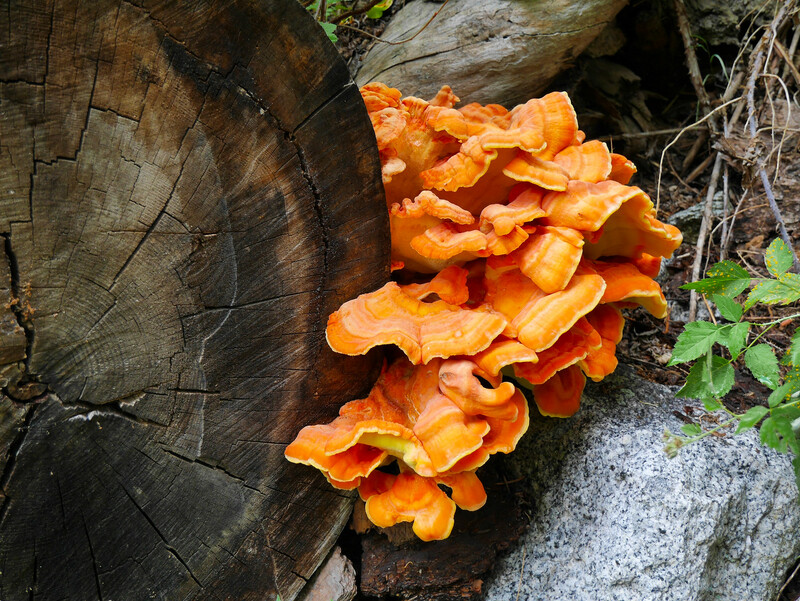 Hobbes wrote: Thanx for the really nice photos - especially the ones of Harrison pass. You might want to consider adding them to the Harrison anchor post here: viewtopic.php?f=31&t=7712. I think anyone researching the pass would really appreciate the perspective you were able to capture. Good idea! I'll go do that now.